November 3 (World Coal) The weak global market conditions and volatility in the resource market continues to pose significant economic and funding challenges for junior and mid-tear mining companies around the world. One such company battling to survive is Mongolia focused coal company, Guildford Coal, which recently announced a change of name and debt restructuring plan. Going forward the company will be known as TerraCom Ltd with the company directors believing that "this name far better reflects the strategic direction and focus to transition to a dynamic energy and resources company." Guildford Coal operates the BNU coal project in South Gobi province, Mongolia, where it is in the process of ramping up production to the target annualised production rate of 1.5 million tpa by the end of the year. The BNU coal project restarted production of metallurgical coal at the end of last year. It contains JORC resources comprising 15.26 million t measured, 8.77 million t indicated and 3.04 million t inferred. The company has offtake agreements for its coal with two Chinese customers: JISCO and Haohai. "While the market continues to remain soft there are some positive signs and there is still strong buyer interest for the BNU coking coal," the company said in its quarterly report. "Guildford remains committed to developing its Mongolian business in the most capital and cost efficient methods." In addition to the BNU project, Guildford is also developing the Uvs project in northwestern Mongolia, where is it targeting production of potash salts, brines and metallurgical coal (Mogi: I wonder if it's the same potash licenses ASX:GMM gave up, the quarterly doesn't seem to mention how GUF got these permits). The company undertook a successful site visit during 3Q15, which included meetings with local ministry representatives and confirmation of approval of the environmental plan for the three licenses that comprise the project. Outside of Mongolia, Guildford Coal is also developing two thermal coal projects in Queensland, Australia: the Northern Galilee project and Springsure project. HALIFAX, NOVA SCOTIA--(Marketwired - Nov. 3, 2015) - Erdene Resource Development Corp. (TSX:ERD) ("Erdene" or "Company"), announced today that it has agreed to extend the term of all of the common share purchase warrants ("Warrants") that were issued in connection with a non-brokered private placement, which closed in two tranches in June 2015, other than those that were issued to insiders. 3,636,431 of these Warrants expire on December 4, 2015 and 1,208,880 expire on December 12, 2015. Effective November 19, 2015, all 4,845,311 Warrants will have their expiry date extended to March 15, 2016. The exercise price of $0.16 and all other terms of the Warrants remain unchanged. November 2 -- The Board of Viking Mines Limited (Viking: VKA.AU) advises that Akoase Resources Limited (ARL) has failed to make the second instalment payment of US$1,710,000 by 31 October 2015 as required under the sale and purchase agreement for the Akoase Gold Project in Ghana, West Africa (Sale Agreement). In accordance with the Sale Agreement Viking has today issued ARL with a Notice of Default under the Sale Agreement (Notice). The Notice requires ARL to remedy the default – which it can do by the full payment of the second instalment US$1,710,000 – within the next 14 days. If the default is not remedied upon the expiration of the Notice then Viking has the right to terminate the Sale Agreement. VANCOUVER, BRITISH COLUMBIA--(Marketwired - Nov. 4, 2015) - Prophecy Development Corp. ("Prophecy" or the "Company") (TSX:PCY)(OTCQX:PRPCF)(FRANKFURT:1P2) announces the cancellation of the remainder of the proposed $2,000,000 private placement previously announced in its September 1, 2015 news release. The Company successfully raised gross cash proceeds of $556,000 through the issuance of 11,120,000 units of Prophecy as announced in its September 30, 2015 news release. 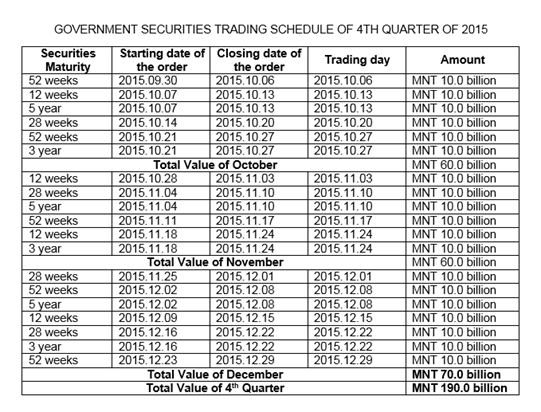 November 4 (MSE) Buy order of 28 weeks Government retail bonds with annual interest of 13.871% starts from 04 November 2015 until 10 November 2015 through brokerage companies. · Mongolia's economic outlook continues to weaken, with our projection for GDP growth now averaging 4.3% over 2015-2018. 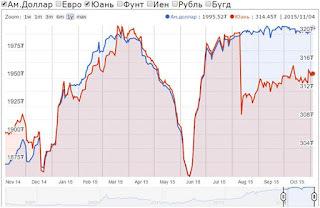 · In addition, weak exports and investment inflows continue to pressure Mongolia's public finances and balance of payments. We also observe that weak institutional effectiveness and predictability hamper policy responses. · We are therefore lowering our long-term sovereign credit rating on Mongolia to 'B' from 'B+' and revising the transfer and convertibility assessment to 'B+' from 'BB-'. We are also affirming our 'B' short-term sovereign credit rating. · The stable outlook balances the country's low-income resource-driven economy, weak policy environment and fiscal performance, high external risk, and limited monetary flexibility with the prospect that large mining projects could quickly reverse Mongolia's sovereign credit profile. On Nov. 3, 2015, Standard & Poor's Ratings Services lowered its long-term sovereign credit rating on Mongolia to 'B' from 'B+'. The outlook on the long-term rating is stable. At the same time, we affirmed our 'B' short-term credit rating on Mongolia. We have revised the transfer and convertibility assessment to 'B+' from 'BB-'. The stable outlook balances the country's low-income resource-driven economy, weak policy environment and fiscal performance, high external risk, and limited monetary flexibility with the prospect that large mining projects could quickly reverse Mongolia's sovereign credit profile during the next 12 months. Upward pressure could build on the rating if the development of the Oyu Tolgoi and Tavan Tolgoi mines accelerates economic growth and improves fiscal and external performances than we currently expect. Downward pressure could emerge on the ratings if Mongolia's external liquidity weakens markedly. · We believe that Mongolia's economic risk has heightened substantially stemming from the significant slowdown in the country's economic performance and outlook. 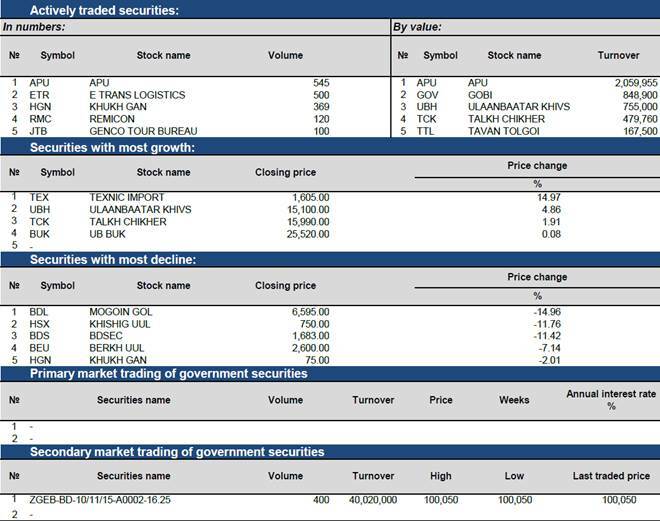 · We have lowered our economic risk score and BICRA on Mongolia to '10' from '9'. · We are lowering our long-term issuer credit ratings on DBM, TDB, and Golomt, and affirmed the short-term issuer credit ratings on these banks. · The stable outlooks on TDB and Golomt Bank reflect our views that the banks will likely maintain their financial profiles for the coming 12-18 months. The stable outlook on DBM reflects that on Mongolia. HONG KONG (Standard & Poor's) Nov. 3, 2015--Standard & Poor's Ratings Services said today that it had lowered the long-term issuer credit ratings on the three banks it rates in Mongolia. The outlook is stable. These banks are Development Bank of Mongolia (DBM), Trade and Development Bank of Mongolia LLC (TDB), and Golomt Bank of Mongolia. We affirmed the short-term issuer credit ratings on these banks and lowered the issue rating on their debt (see ratings list). Hong Kong, November 03, 2015 -- Moody's Investors Service says that government support for the Development Bank of Mongolia LLC (DBM) will remain strong despite the expectation that the policy bank's role in financing certain types of investments will fall. "Looking ahead, we expect that DBM will play a reduced role in financing investments that would more appropriately be recognized as government spending," says Hyun Hee Park, a Moody's Assistant Vice President and Analyst. "However, we expect that the government will continue to use DBM as its main credit policy vehicle to provide loans to sectors such as infrastructure, railway/road transportation, energy, mining supply chain industries and export-oriented and import-substitution industries," adds Park. Park's comments were contained in a just-released report on DBM, "Development Bank of Mongolia - Strong Government Support Underpins Credit Profile." Park was also speaking after Moody's had assigned to DBM a B2 issuer rating; a caa1 baseline credit assessment (BCA) and adjusted BCA; as well as a B2(cr)/NP(cr) long- and short-term Counterparty Risk Assessment (CR Assessment). The outlook for all ratings is negative. The B2 issuer rating incorporates a two-notch uplift from the bank's BCA of caa1, due to Moody's assessment of full government support in times of need. Such support mitigates the bank's weak standalone credit strength. At the same time, Moody's notes that DBM's standalone credit profile is weak, pressured by its policy role, and its performance moderately worse than that of its domestic peers. November 3 (Bloomberg) -- Inbound foreign direct investment falls to $156.5m in Jan.-Sept. vs $543.9m yr earlier, according to data released by central bank Tuesday. 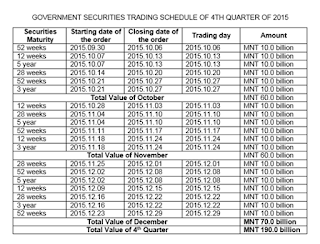 November 3 (BoM) On the Foreign Exchange Auction held on November 3rd, 2015 the BoM has received bid offers of USD 26.1.0 million in a rate between MNT 1990.00-1993.60 and CNY 73.7 million in a rate between MNT 313.05-314.32 from local commercial banks. The BoM sold USD 11.0 million in a closing rate of MNT 1992.15 and CNY 38.5 million in a closing rate of MNT 314.00. On October 3rd, 2015, The BoM has received USD Swap agreement selling bid offer equivalent to USD 20.0 million and USD Swap agreement buying bid offer equivalent to USD 5.375 million from local commercial banks and the BoM has accepted the offers. November 3 (infomongolia.com) The "National Savings Program" is launched at the initiative of Golomt Bank jointly with the Bank of Mongolia (Mongolbank) to provide long-term support to the economic growth of Mongolia. If one of three citizens of Mongolia put 50 thousand MNT (Tugrug) each month to his or her savings account, it would become 13 million MNT in ten years creating savings of 3.3 trillion MNT to the state. National savings can keep money flow in the country and prevent economic crisis and further it can enhance economic growth of the country. National Savings Program was developed at the initiative of Golomt Bank within "National Program to Improve Basic Financial Knowledge of Mongolian Citizens" and the Central Bank's policy to promote national savings. The "National Program to Improve Basic Financial Knowledge of Mongolian Citizens" was developed as a response to financial survey conducted in Mongolia by World Bank in 2012. The financial survey of World Bank tested the financial knowledge of Mongolian citizens comparing to other countries. According to the survey, Mongolia showed poor results. To improve the situation, the Bank of Mongolia, Ministry of Finance of Mongolia, Financial Regulatory Commission (FRC), and Ministry of Education, Culture and Science and other organizations related to finance such as universities and non-government organizations have decided to develop own national program to upgrade the financial knowledge of Mongolians. M r . E.Batshugar, Vice President of the Bank of Mongolia, and Mr. D.Sugar, Vice President and Director of Business Development Division of Golomt Bank, signed the memorandum on cooperation agreement on November 02, 2015. Golomt Bank will advertise the national savings program to the public through its web site www.edu.golomtbank.com launched on May 19, 2015 to promote financial knowledge of Mongolian people. November 3 -- On Thursday 5​ November 2015, The Economic Club of Ulaanbaatar will present James Anderson, Country Manager and Resident Representative for Mongolia from the World Bank, from 7.30 - 9.30am at the Corporate Hotel speaking on the topic "Why Governance?" Everyone talks about the importance of governance, but what does it really mean? Is good governance a prerequisite for economic progress? Or is it a luxury to be bought when the country can afford it? Mr Anderson will reflect on the links between governance systems and economic performance, on what is known and still debated. He will also reflect on his time in Mongolia in the 1990's and how the economy and governance challenges have shifted since then. Mr Anderson has a PhD in Economics from the University of Maryland, USA and has worked in a range of governance issues including access to information, transparency, anti-corruption, judicial reform and land management in former Soviet Union countries. He has co-authored several books, including ​Anticorruption in Transition 3​and ​Judicial Systems in Transition Economies ​and has had research published in the Journal of Comparative Economics and Economic Inquiry. The Economic Club of Ulaanbaatar is just one of the projects established by the Silk Road Foundation (SRF) and provides an opportunity for top business professionals, economists, politicians and decision makers to discuss the major economic issues facing Mongolia. The session will be moderated by Economist and ECUB Board Member Mr D. Ganbold, and situated in the Berlin Room at the Corporate Hotel and Convention Centre. For guests interested in attending this presentation, please register with the SRF by 5.00pm, Wednesday 4 November via email econclub.ub@gmail.com. Tickets are 30'000 MNT for guests and 25'000 MNT for members, including a hot breakfast. November 2 (gogo.mn) With the joint investment from the state budget and ADB, 214.1 km long road has been completed under the project of vertical line road stretching from Altai soum to Mankhan soum in Khovd province. The road construction commenced in March of 2011 has now been completed after 4 years. The road is considered by Asia - Pacific Economic Commission of UN as highly important to connect Mongolia with China and Russia through the route of AH4. Chinese-invested China Jiangsu Jianda Construction LLC single-handedly established the road, with technical assistance from Korea Consultants International, KHZT LLC and Soyombot Road LLC. Rural residents, local officials and experts highly value the quality of the road. Total of 137.8 meter square area designed for two stop areas, 217.1 meter square area designed for sideway parking area, six intersection roads, 13 crossroads, 374 water drains, 14 concrete bridges with length of 45-120 meter and other road facilities are included. Over 700 rural residents were employed for the construction. November 3 (UB Post) The Parliamentary Standing Committee on Economics met on Tuesday, for the second time, to discuss bills on the 2016 state budget plan, the Human Development Fund budget for 2016, and Social Insurance Fund budget. The attendance for the meeting was low, with only half of the committee's members present. Head of the working group in charge of the bills, G.Batkhuu, began with a report on proposals and evaluations, after which, members started asking questions. MP Ts.Nyamdorj pointed out that many concession agreement holders who have completed their projects have not been able to receive payment for their services. He asked if the working group studied the issues and asserted that their payments should be added to next year's state budget plan. The standing committee unanimously agreed to include payments for concession agreement holders in next year's budget. Finance Minister B.Bolor said that the ministry is working to give full payment to projects that were completed through concession agreements. He noted that in the amended 2015 state budget, Parliament agreed to grant payment to projects that were more than 80 percent complete through debt securities, and that more than 180 businesses had been issued with debt securities. The minister added that the necessary funds have been included in the 2016 state budget. The committee agreed to include necessary funding for compensation to laid off state employees, benefits, and wages in the 2016 budget. Funding for these expenses was cut when the cabinet cut costs to reduce budget spending. The committee also supported MP Ts.Nyamdorj and G.Batkhuu's proposal to decrease additional investment projects in 2016 and finish the projects that have been started. Members agreed that it was best to finish the projects that have been started and only consider spending on projects that are crucial. The draft laws on amending general state registration and the Law on Statistics have been sent back by the standing committee to the developers of the bills for additional evaluation. The Standing Committee on Economics agreed to postpone discussion of the one billion USD loan from Export-Import Bank of China, as members said they had only just received the documents related to the loan and had not had the opportunity to review them. The loan is expected to be used by the government to fund a variety of projects, including the Egiin River Hydroelectric Power Station and road and infrastructure projects. Ts.Nyamdorj said that the Mongolian People's Party needed more time to evaluate the documents. "There are numbers, such as 65 percent of equipment suppliers being lenders, which need to be talked about. You can't rush this through just because the deadline is so tight," he said. The committee agreed with the sentiment and asked the Mongolian People's Party to discuss the matter soon. During the meeting of the standing committee, a majority of members supported MP Ts.Nyamdorj's proposal to give directives to the government and Mongol Bank to decrease loan interest rates at commercial banks. The head of the working group in charge of monetary policy, Ts.Bayarsaikhan, agreed that loan interest rates were high, but noted that there are legal concerns when mechanically reducing interest rates. Ts.Bayarsaikhan said that the working group has included clauses in 2016's monetary policy to ensure economic equilibrium, stabilize the financial sector, and support other sectors of the economy through the state budget. The committee supported the working group's proposed clauses. November 3 (Mongolian Economy) A Japanese professor laid a rug with a picture of Genghis Khan for his dog. L.Oyuntsetseg, a professor at the Mongolian University of Science and Technology, told this odd-to Mongolians news during the Ulaanbaatar Forum 2015 held in April. This is an example of how Mongolia produces goods without considering for whom and for what purpose goods are being produced. Essentially, we lack knowledge-based industries. Small- and medium-sized manufacturers (SMMs) face many such obstacles during their development. They need to study market demand and the global market, instead of producing things with which they are familiar. It is inefficient to limit this sector with solely domestic market demand. If we are talking about development, we need to look beyond the border and strive to enter bigger markets. Support for the expansion of factories and other export-orientated changes are being made to state policies. The Head of Small and Medium Sized Industries Policy Coordination Department of the Ministry of Industry, G.Bilguun, said that his department is working on categorising manufacturers more precisely into "small", "medium" and "micro" categories in order to implement a policy tailored for each industry. One of the possibilities for industries to grow and expand their market is through cluster development. A business cluster is a geographic concentration of inter-connected business, and it is at the core of the policy to support SMMs. Mongolia's manufacturers have to go through each stage of factory development on their own. This is the main problem they are facing. However, they will have an opportunity to improve productivity, expand their market and boost competitiveness by developing in clusters. One entity spins the yarn, while others are responsible for the knitting, packaging and sales. The result is a greater potential to expand into foreign markets. The head of the Strategy and Policy Planning Department of the Ministry of Industry, D.Battogtokh, believes Mongolia has the potential to develop clusters orientated towards products such as meat, sea buckthorn, leather and clothing. We need to raise awareness about cluster development and its advantages to SMMs. Domestic manufacturers, especially SMMs, are often criticised for not aiming for foreign markets and not producing competitive products. However, several medium-sized manufacturers, such as "Best Shoes" and "Khanbogd" cashmere, have already crossed the border. Constituting approximately 20 percent of the GDP, SMMs are indeed looking to foreign markets, because state policy will now support exports and import substitutive production. Currently, SMMs make up only 0.7 percent of net exports. In this regard, the Ministry of Industry stated they will replace the previous system where enterprises receive funding by proposing their projects and introduce a new system that supports manufacturing, introduction of new technologies and exported-orientated production. "Mongolia is a country with a weak industrial base," stated S.Demberel MP. "Nowadays, there's the new industrial concept of sustainable and accessible industrial development. That is what must strive towards." He warned that although protecting domestic manufacturers is good, there is a risk of causing artificial conflict between the import and manufacturing sectors. The Ministry of Industry is continuously taking legal measures to support SMMs and protect them. However, there are those who say manufacturers have to be able stand on their own two feet. Many people note that although people engaged in manufacturing went through difficult times over the past 20 years, they have developed resilience and have learned to compete with imports. S.Demberel noted that we need to avoid creating incubator conditions for domestic producers and that the boundary between policy and competition must be clear. Thus, we need to study and evaluate several things before protecting industries blindly. As of last year, 59,800 economic entities registered in the registration database are actively operating, and 84.6 percent, or 50,600, of them are SMMs. Of these SMMs, light manufacturing accounted for six percent, construction for 8.5 percent and agriculture for 6.2 percent. The trade services sector accounted for 44.6 percent of SMMs, the highest among the sub-sectors. The ministry also intends to support manufacturing through its foreign trade policy. In order to develop SMMs, learning from the experiences of other countries with more developed manufacturing sectors is important. For example, the development of Asian tiger countries was rooted in SMMs, a shining example of which would be Taiwan. There are many countries that experienced economic recovery by supporting manufacturing. There is a need to develop the 378 SMMs engaged 145 different types of business. About 205 products were identified as national brand products, and 70 percent are food, tourism and textile products. The Deputy Director of the Mongolian National Chamber of Commerce and Industry, M.Sarandavaa, noted that Mongolia has the capacity to develop 205 brand products in 17 sectors, products such as clothing, shoes, meat and meat products, milk and dairy products, wool and cashmere just to name a few. Officials say that Mongolians have the resources and potential to develop SMMs. On the other hand, wealth creators have a big desire to enter international markets. "SMMs account for 85 percent of all manufacturers. Although they make up about 20 percent of GDP, their contribution to exports is very low. This is a reflection of manufacturers not being able to expand their operations and production," stated G.Bilguun. This has everything to do with out-dated state policies that were not reformed until very recently. However, this sector now has its own specific ministry, and the ministry is actively supporting boosting production and penetration of international markets. Officials noted that public-private partnerships are an ideal way to resolve issues faced by SMMs. SMMs can only develop by resolving these current issues, which also means the state must share the burdens of SMMs. Ulaanbaatar, November 4 (MONTSAME) The parliamentary Standing committee on economy Wednesday focused on a draft general credit agreement of USD one billion, which will be established between the government of Mongolia and the Export-Import Bank of China. Majority of the gathered agreed that the discussion of the draft agreement must be continued and decided to convey their proposals and conclusions to the Standing committee on security and foreign policy. The draft, presented by B.Bolor, the Minister of Finance, to the Standing committee meeting, was finally approved during a bilateral meeting in Beijing on October 28 of 2015 after it had been exchanged three times for consideration and sides had concurred to finance projects on the energy and other sectors. The loan has two-per cent interest per year, the repayment period will be 20 years, where first seven years will be freed from the basic payment. The loan is expected to finance 85% of the each project. Since the discount level is 29%, this loan is considered as a soft loan, in accordance with the law on debt management. The credit agreement is expected to be signed during upcoming this November state visit of the President to China. According to A.Tleikhan MP, the loan will finance projects on construction of the Eg River hydropower station, on augmenting a capability of the thermal power station of Erdenet city, on building over-head voltage lines between Ulaanbaatar and Mandalgobi soum of Dundgobi aimag, on sub-stations, and on constructing a 20km Gachuurt--Nalaikh--Choir road. Ulaanbaatar, November 3 (MONTSAME) Funded by export soft loans by the Government of China, agreements will be concluded with the selected of the listed Chinese companies to build 114 km road between Tosontsengel and Uliastai of Zavkhan aimag, and 129.4 km road between Bayankhongor with Baidrag Bridge of Bayankhongor aimag. The cabinet allowed on Monday the Minister of Road and Transport M.Zorigt to manage the works. The Minister was also assigned to conclude the agreement on consulting for building of Ulaanbaatar-Khoshig Valley Airport (NUBIA) highway. The former Premier of the State Council of the People's Republic of China Wen Jiabao paid a visit here in 2010 and opened a easy-term credit line of USD 500 million. Following the deal, the governments agreed to implement 13 project, funded by the credit. The credit is allowed with 2 percent annual interest and repayment condition of 20 years. The list of projects was issued by Cabinet in 2015, in an annex to the Resolution No 309 on "Project to be realized on credit funding". As China's Government proposed, the road and construction projects will be executed by the suitable companies, selected from the listed Chinese companies. November 4 (gogo.mn) Standing Committee meetings are scheduled for today. 1. Economic Standing Committee at 09AM. 2. Budget Expenditure Monitoring Sub-Standing Committee Meeting at 09AM. 3. Environment, Food and Agriculture Standing Committee meeting at 10AM. 4. Budget Standing Committee meeting at 02PM. 5. Application Standing Committee meeting at 02PM. 6. Security and Foreign Policy Standing Committee meeting at 04PM. November 3 (infomongolia.com) Prime Minister Ch.Saikhanbileg has proposed to take actions against economic difficulties that Mongolian government faces by cutting wages of high officials, administrative workers and Governors, and dismissing unnecessary advisory and assistants of the members of the Parliament and Ministers. According to his proposal, wages of high officials should be reduced by 30 percent, and Governors and administrative workers by 10 percent. However, at the autumn plenary session, where the Parliament is discussing the budget highlights of 2015 and the amendment to Law on Budget for 2016, Prime Minister's proposal faced strong resistance of political parties. At the Cabinet meeting held on November 02, 2015 it was decided to dismiss Deputy Ministers of the current Government despite the protest. These actions are taken as necessary measures to tackle economic crisis in Mongolia, which is likely to continue in 2016. Ulaanbaatar, November 3 (MONTSAME) The cabinet meeting on Monday fixed a maximum number of staffers to work at administrations of soums. The numbers will depend on population, territorial sizes, number of entities, and frames of public service organizations. The administration of a soum with a population of up to 1,500 people will have 12 staffers, a soum with 1,501-3,000 people--14 staffers, with 3,001-5,000 people--15 staffers, with 5,001-10,000 people--17 staffers, with 10,001-20,000 people--20 staffers, and a soum with more than 20,001 people--22 staffers. - The cabinet discussed results of the President's participation in the UN High-Level Panel on the post-2015 Development Agenda and in the General debate of the 70th session of the UN General Assembly on September 24-27 in New York, the USA. An order was given to the FM to submit the issues to the National Security Council (NSC). - The cabinet backed in principle a draft amendment to the law on election of the State Great Khural (parliament), and considered as necessity to convey some proposals to the draft initiators. It also backed in principle a bill on public poll and decided to issue a note on it. - The cabinet backed draft amendment to the laws on pensions and allowances allotted from the Social Insurance Fund (SIF), and decided to convey some proposals to the draft initiator. - The cabinet also backed a draft credit agreement to be established between Mongolia's Ministry of Finance and the Export-Import Bank of China, and decided to have the PM issue an order on authorizing an official to sign the agreement. By the agreement, projects will be implemented to repair an old bridge and constructing new one in Yaarmag, building a grain elevator and constructing a tunnel-bridge. - The cabinet considered a project to be implemented with money of USD 244.5 million, the remaining of the loan of a general agreement between the governments of Mongolia and the Republic of Korea. The loan has been allotted from the Foundation for Economic Cooperation for 2011-2015. A relevant resolution of government will be issued, and the Minister of Finance was obliged to convey to the S.Korean side a proposal on the project to be realized with the loan. - The cabinet backed a draft intergovernmental agreement between Mongolia and Turkey on the financial cooperation in the military sector. A PM's order on authorization will be issued. - A new composition of the Regulatory Council of Agricultural Products and Raw Materials Exchange was approved. This council will be chaired by the State Secretary of the Ministry of Food and Agriculture. - The cabinet approved a maximum of foreign labor force and professionals to work in entities and organizations for the next year. - By the decision, 159 foreign workers and professionals of the "CGGC Mongolia" LLC will work here to construct piles, fundamentals and pillars on the Selenge River in accordance with a concession contract on the construction of the Eg River's hydropower station. The Minister of Labor G.Bayarsaikhan was authorized to give permission to the foreign people to work here. - Some Vice Ministers were discharged from their posts under the amendment to the law on government which was passed this October 30. Ulaanbaatar, November 4 (MONTSAME) The Mongolian People's Party (MPP)'s chairman M.Enkhbold and the secretary general J.Monkhbat received November 4 a petition from elderly members of MPP and the Mongolian People's Revolutionary Party (MPRP), proposing for the two parties to attend the parliamentary election 2016 as a coalition. "More than 60 percent of Mongolia's territory is being operated by foreign companies under mining permits (Mogi: lol) and the state debt has hit its ceiling", the seniors criticized the current parliament. The petition has been signed by 44 distinguished senior members of the MPP and the MPRP. Ulaanbaatar, November 4 (MONTSAME) The chairman of the Mongolian People's Revolutionary Party (MPRP) Mr N.Enkhbayar Wednesday met Mr Xin Haiming, the Ambassador Extraordinary and Plenipotentiary of the People's Republic of China to Mongolia. Expressing thanks to the Ambassador of China for the meeting, Mr Enkhbayar emphasized there are many works for the MPRP to expand the Mongolia-China cooperation, and hoped the Ambassador will contribute to it. "The two countries have big opportunities to collaborate in the areas of infrastructure, energy, railway, agriculture and small- and middle-sized productions. I hope that the Ambassador will support opening a big chance for Mongolian students to study in China's universities and institutes and to learn Chinese," the MPRP chairman said. In turn, Mr Haiming thanked the MPRP chairman for an audience, and underlined that the MPRP and its chairman Mr Enkhbayar significantly contributed to broadening the bilateral cooperation. He added that the Communist Party of China (CPC) is ready to develop friendly ties with all political parties of Mongolia. Mr Haiming said he will do his best to bring the bilateral relations into a new level and to realize proposals and initiatives of the MPRP after scrutinizing them. November 4 (gogo.mn) Oyu Tolgoi underground development forum is being held today at State Opera and Ballet Theater. The forum aimed to provide information about the underground development, to discover potential suppliers, to establish partnership between Mongolian and foreign companies, and to organize underground procurement activity openly, with introducing principles of procurement and contracts. Over 600 companies from 29 countries who are seeking to supply services and products to underground development are attending the forum. Majority of companies comes from Mongolia (400), China, Canada, Australia and USA. Also, representatives from Embassies of Australia, Canada, Czech, Republic of Korea and UK are taking part in the forum. Last year, Oyu Tolgoi LLC received half of its products and services from local companies. Then, the underground development is certain to improve volume of products and services received. Oyu Tolgoi LLC officials promised that selection process to choose supplier companies is going to be open and fair. As the first speaker of the forum, President and CEO of Oyu Tolgoi LLC Andrew Woodley said: "Oyu Tolgoi LLC is a Mongolian company. We are working on reducing expenses and increasing profits. 80% of the Oyu Tolgoi reserves remain underground. We will be major player in copper and gold markets with the introduction of underground mining. CEO of Erdenes Mongol LLC B.Byambasaikhan spoke: "Mongolian companies all have benefited from Oyu Tolgoi mine, which is fundamental to Mongolian competitiveness at global stage. For instance, GDP of Mongolia, USD 4.5 billion in 2009, has witnessed three-fold increase within last five years thanks to the project. Every single dollar spent on the project implementation is followed by two dollars. Within last two years, the company has exported 1.5 million tons of copper concentrate. Total of USD 4.2 billion is needed in order to finalize the underground development. 19 international financial organizations are having negotiation to raise the required amount of money for the investment. Mr B.Byambasaikhan is confident that the negotiation is going to be completed within this year. Ulaanbaatar, Mongolia, 3 November 2015 (Oyu Tolgoi) Oyu Tolgoi was named as Company of the Year for 2015 by the Business Council of Mongolia (BCM), an organisation dedicated to the promotion of trade and investment in Mongolia, representing all investors - domestic and foreign. Business Council of Mongolia Executive Director, Jim Dwyer, said: "The Business Council of Mongolia is delighted to acknowledge that Oyu Tolgoi, one of our longest and most loyal members, has been awarded 'Best Company of the Year 2015'. A significant milestone in the development of Oyu Tolgoi was reached this year with the agreement to progress the Underground Development of the mine. We strongly believe the Oyu Tolgoi project is and will continue to be, an important milestone by which to measure the development of Mongolia." Speaking at the event, Oyu Tolgoi President and CEO, Andrew Woodley, said "I am honoured to accept this award on behalf of Oyu Tolgoi's 5,825 employees. This award is a testament to strength, dedication and commitment of our workforce that is building a world class Mongolian company. We thank the Business Council of Mongolia for the recognition of what we have achieved, and our potential as we work to deliver our next phase of growth." November 3 (Deutsche Welle) Mongolia's economy was booming just a few years ago, but is now in the dumps due to the sharp drop in mineral resource prices across the globe. Mining forms 30 percent of the Asia country's economy. GDP growth has dwindled from an eye-watering 17 and a half percent in 2012, to a pace of only 3 percent in the first half of this year. But the bad times may be coming to an end. November 4 (gogo.mn) According to the report introduced in November 2014 by Mineral Resource Authority, 919 companies own 2751 exploration and exploitation licenses. Some companies own 20-30 licenses while some of them are 100% foreign invested or joint ventures. The graphic below shows ten companies which own most number of exploitation licenses. The company has established in 1995 and started its mining from Bayangol deposit located in Burenhangai soum, Bulgan aimag. Currently, Altandornod Mongol LLC founded by the Sergei Paushok who included in the World`s Billionaires List by Forbes, has 30 exploitation licenses. It has total of 10,248 hectares of operational area in Tuv, Bulgan, Arhangai and Uvurhangai aimags. The major gold deposits are located in Tsenher Soum, Arhangai aimag and Zaamar soum of Tuv aimag. Altandornod Mongol LLC is 100 percent Russian invested company. "Mongolrostsvetmet" LLC is established in 1973 by an Agreement between Mongolian and Russian Governments. Operational main areas of "Mongolrostsvetmet" LLC is to export fluorspar and its Mineral processing plant Bor-Undur has successfully operating since 1983. "Mongolrostsvetmet" LLC owns total of 3,859 hectares of operational area in Bayan-Ulgii, Dornogobi, Hentii, Bulgan, Bayanhongor, Dundgovi, Tuv and Uvs aimags. "Mongolrostsvetmet" LLC is Mongolia-Russian joint venture. The company has founded in 1993 by Mongolian citizens B.Nyamtaishir and his son MP N.Nomtoibayar. The first placer gold mine started the operation in Ikh Galt alluvial deposit of Zaamar soum (sub-province), Tuv aimag (province). First coal mine opened at the Alagtolgoi property in Dalanjargalan soum, Dornogovi aimag. Currently, it owns 13 coal mining licenses in cooperation with its daughter company. Even Mongolyn Alt Corporation is operating in many sectors including cement production and tourism, their major operation is coal export. Nariin Suhait located in Gurvan Tes soum, Umnugobi aimag is the main deposit of Mongolyn Alt Corporation. More than 5 million tons of coal have explored from Nariin Suhait deposit during 2010-2012 which ranks first in Mongolia. Mongolyn Alt Corporation is 100 percent Mongolia invested company. Gatsuurt LLC is an open-fit gold mining site in Mongolia and founded in early 1990. Gatsuurt LLC started its operation in geology and mining sectors. Currently Gatsuurt LLC is operating in many sectors including agriculture, farm, tourism and construction. It own 15 gold deposits in Selenge, Darhan-Uul, Uvurhangai, Arhangai and Bayanhongor aimags and one limestone deposits in both Darhan and Ulaanbaatar cities. It has total of 9339 hectares of operational area and owns exploration lincense in Gurvanbulag soum, Bayanhongor aimag. Centerra Gold Inc. is a gold mining company headquartered in Toronto, Ontario, Canada. Centerra owns 14 gold mining licenses of Boroo Gold LLC and Centarra Gold Mongolia. Centerra established Stability Agreement with the Government of Mongolia in 2004 and explored 46 tons of gold for seven years. Gold exploration of Boroo Gold increased GDP by 6%. However, many researchers believe the contract was unprofitable for Mongolians. The next project of Centerra Gold is Gatsuurt deposit located nearby Noyon mountain. Gatsuurt deposit has a total estimated resource of 28 million tons of ore and 76 tons of gold. Except 14 gold mining licenses, Centerra owns limestone deposits in Darhan-Uul aimag. Moreover, it has four exploration licenses in 37302 hectares of land located in Tsagaan-Ovoo soum, Dornod aimag. Previously, the company owned 52 licenses. Currently it owns 11 licenses. D.Bayanbat serves as CEO of Datsantrade but the original owner of the company is still uncertain. It has total of 1050 hectares of land for 9 gold deposits and 2 coal deposits in Uvs and Hentii aimags. 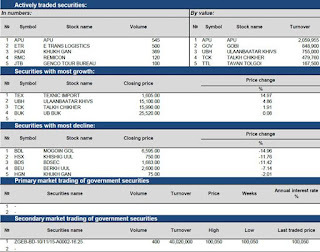 Datsantrade is 100 percent Mongolian invested. It owns two major cocking coal deposit located in boundaries of Gobi-Altai and Bayanhongor aimags. Shinejinst and Zeegt coal deposits have a total estimated resource of 95 million tonnes. Erel JSC founded by the former MP D.Erdenebat has nine mining licenses. The main operation of the Erel Group is cement production and limestone. It has total of 675 hectares of operational area in Drhan-Uul, Gobisumber, Tuv, Ulaanbaatar and Dornogbi aimags. Moeover they have gypsum deposit in Dornogobi aimag, gold deposit in Huvsgul aimag and exploration license in 5122 hectares of land located in Bulgan soum, Hovd aimag. Erel JSC is 100 Mongolian invested. Mongolian Energy Corp Ltd is known as the owner of Hushuut deposit. Mongolian Energy Corp Ltd is 100 percent foreign invested. Share of Mongolian Energy Corporation was HKD 12.28 in 2011 and due to drop of prices for coal in world`s market, share of Mongolian Energy Corporation reach HKD 0.23 today. Hushuut coal deposit has a total estimated resource of 141 million tonnes. The Country Director of MoEnCo Mr. Dolan said that MNT 715 billion invested to the Hushuut deposit. MoEnCo owns eight mining license and 2203 hectares of area in Darvi and Uyench soums of Hovd aimag. Erdenes Tavan Tolgoi JSC has founded in 2010 and was obliged to operate in strategically significant Tavan Tolgoi coal deposit. Tavan Tolgoi coal deposit has a total estimated resource of 6 billion tonnes, one quarter of which is high quality coking coal and 4.6 of which is energy coal. 1 million tons of coal exported through Gashuun Sukhait border crossing in 2011 and 2.4 million tons of coal exported in 2.4. Erdenes Tavan Tolgoi JSC owns total of 68.471 hectares of operational area and eigh licenses. Erdenes Tavan Tolgoi JSC is 100 percent government owned company. November 3 (UB Post) Darkhan Metallurgical Plant has returned to normal operations. The plant's activities were suspended last summer and a large number of its employees placed on leave. The company's leadership reported that the drop of iron ore prices in the global market had negatively impacted the company's activities. They added, that as a result of taking complex measures for not derailing the plant's operations, the company is now back to normal activities and its staff has returned to work. Currently, over 300 employees have returned to work, with 200 people working on the construction of a road being built from Selenge Province's Dulaankhaan station to Khuder soum. Darkhan Metallurgical Plant and Peak Development are working together to build the 104.5 km paved road. The company authorities also added that over 1,300 people are currently employed by the plant, over 1,200 of whom are Darkhan residents. Darkhan Metallurgical Plant says it is working toward establishing a mining metallurgical complex by 2019, based on the iron ore deposits of the Darkhan and Selenge regions. They believe that by opening the metallurgical complex Mongolia will be able to domestically and fully meet its demand for steel. The complex will be built near the current steel plant, on approximately 150 hectares in Darkhan-Uul Province and Khongor soum. On November 1, Governor of Darkhan Province A.Enkhbold visited the plant, and said that after becoming acquainted with the feasibility study, environmental assessment, and plans for the metallurgical complex, a decision on land acquisition will be made. Ulaanbaatar, November 4 (MONTSAME) Chairman of Ulaanbaatar Railway joint venture L.Purevbaatar and the president of Korea Railroad Corporation (Korail) Choi Yeon-hye signed a Memorandum of Understanding on November 4. The officials noted that signing of this document is of great importance in penetrating the "third markets" such as the Republic of Korea and Japan with our mining products. This year, the UB Railway commenced a work to open access for Mongolia to international waters through Rajin port of North Korea. Mongolia will be able to deliver its copper concentrate and other mining products to international consumers other than China. In the first nine months of 2015, railways of Mongolia carried 14 million tons of freight and two million and 165 thousand passengers. Transit freight made up 11.2 percent of the total amount of railway freight carrying, while domestic freight covered 47.6 percent, import freight –12.2 percent and export –29.1 percent, shows the statistics. As for the railways revenue, it reached 283.7 billion MNT in the first nine months of this year, representing a decrease of 8.6 percent or 26.6 billion Togrog against the same period of 2014. November 3 (gogo.mn) Mongol brands and products have been recently introduced in great number and at same time, very competitive with imported goods. But, we can safely say that we have not seen for a while a high technology product created by Mongol minds. Xphone is certainly promising Mongol brand, which can impose a great challenge for foreign brands in same field. Today, we deliver the interview with Brand Manager of Way-Out LLC D.Ariunbold. It has been several months since Xphone was introduced to the market. How well is the sales going and how do people receive the brand? Our product was firstly released to the market in last January, when its sales started growing gradually despite not publicly promoted. Then, we were into developing a marketing plan in July and officially introduced our products to customers in September, with intensifying marketing and promotion activities. Following successful marketing campaign, our sales have been increasing and are expected to grow in the further. You might have noticed from our official facebook page that most of our page posts have been made within last two to three months, including video promotion, brochures and others. Namely, the video promotion is considered to be very successful and much appreciated by the public. When did an idea of creating the smartphone come into the mind? CEO Ch.Battulga initially brought up the idea of creating the smartphone, which has become a reality starting from last December and January. Today our phone is available at all branches of Mobicom, Skytel and Next Electronics. We firstly started working on our ideas two years earlier and it was required of a great deal of time in order to select foreign borders. For me, I am working as brand manager of Xphone. It is interesting for local people that Mongolian brand "smartphone" is being created. It is obviously not easy to make all components of Xphone in Mongolia – thus, where do you get your products manufactured and assembled? Also, which part of the production do you get involved in except of the management? Apparently, we brought up our idea of creating local brand smartphone – Xphone in order to compete and to replace import products in the further – to penetrate into foreign markets if possible. Therefore, we worked and instilled our ideas and creativeness into every details and aspect such as design and functions, which is developed into a tangible asset or phone by our contract manufacturing company. The designing part of the phone is prepared in Hong Kong prior to moving into get assembled in China. There is no other smartphone brand called 'Xphone" with similar design and trademark in the world. We received a patent for our products from Mongolian Intellectual Property Agency. Please give us details of the phone? Xphone has two models of phones so far: X4 and X5 released in white and black colors. X4 has 4-inch display, whilst X5 has 5-inch display. X4 phone is appropriate for customers who have regular needs of a phone such as texting, calling and internet service, as X5 should be good for ones who prefer more functions, specifications and better design. Also, both models are available in dual languages of English and Mongolian as well as accept dual sim cards. What are the purchase conditions of the product? Despite currently not available for the lease, our products' prices are affordable and moderate compared to others. X4 model is sold at MNT 160.000 as X5 model can be bought at MNT 360.000, with 6-month warranty. Since our product is officially created and assembled by our contract company, it is brought to customer with the sealed package and all accessories, which confirms in return that our phone is not refurbished product. Also, there is no intermediary individual or entity between our company and our contract manufacturing company. Our company manages repair services and additional accessories sale. Currently, two models have been released. Other smartphones are updated into next version annually. Would your product follow same path? If so, when is a new model to be available at the market? Next models of our products are to be released in December. But we would keep such information secret until the release date. Furthermore, we plan to introduce new models every year. We believe that our products are competitive enough compared to other medium level of foreign phone brands. You guys are creating a Mongolian brand and clearly must have a strong ambition to compete with imported phones. What would be your future goal? Yes, of course. Our goal is to create a product that is competitive enough to replace the imported cell phones and even to find a way to produce our phones here in Mongolia. For now, we have created an Xphone – a phone brand, but in the future we plan to expand it to Xbrand. However, domestic manufacturing of a cell phone is very challenging. Especially for a phone that requires a high technology and cost. We also established cooperation with Royal Music Productions to create first Mongolian-themed "ringtone". It means that the ringtone is created with a melody of Mongol music instruments, which is only played in an Xphone. It is believed to be one of features to separate our brand from foreign ones if we penetrate into foreign markets. People usually think that an Xphone is made in Mongolia since it is Mongol brand. The branding is not about manufacturing or assembling a certain product. For instance, Iphone is US brand, but it has "Assembled in China" on its backside. Similarly, HTC is Taiwan brand as well as Samsung is Korean brand. However, all of them are manufactured and assembled in China. So, Xphone is Mongol brand. It is how we should see the brand concept. SHANGHAI, Nov. 4, 2015 /PRNewswire/ -- October 2015 marks the launching ceremony of China, Mongolia and Russia Economic Corridor (Shanghai) Cooperation & Exchange Center jointly established by World UnionPay Financial Services Co., Ltd and China Emperor Art Bank. Meanwhile, China, Mongolia and Russia Economic Corridor (Shanghai) Exchange & Trading Platform has been set up within Chinese Wine Financial & Culture Industrial Park. Public figures attending the launching ceremony from China and Mongolia included Sun Feng, Chairman of the Board of World UnionPay, Zhang Kaiyi, CEO of World UnionPay, Ling Jinting, CEO of China Emperor Art Bank Co., Ltd, He Xiaoling, China Helen Charity Foundation, B. Togtokhbayar, Director of Management Committee of Altanbulag Free Trade Zone under the Ministry of Industry and Trade of Mongolia, Baasandorj, Director of Management Committee of Zamyn-uud Free Trade Zone and more than 100 other people. Both parties have signed agreements on a variety of cooperation projects, including the establishment of China-Mongolia International Barter Settlement Platform and Trading Center, China-Mongolia Base Wine Storage Center, China-Mongolia Finance Currency Exchange Center, China-Mongolia Medium & Small Enterprises Service Center and China-Mongolia Global Village in the free trade zones of Mongolia. China, Mongolia and Russia are not only friendly neighbors, but also comprehensive strategic partners of cooperation and important members of the "One Belt & One Road" corridor. China, Mongolia and Russia Economic Corridor serves as an important part in "One Belt & One Road" strategy proposed by China. In consideration of the fact that the development strategies of China, Mongolia andRussia are highly consistent, the three parties will jointly prepare the Planning for the Construction of China, Mongolia and Russia Economic Corridor. World UnionPay Financial Services Co., Ltd participates in the construction of China, Mongolia and Russia "One Belt & One Road" Economic Corridor, with the aims of positively responding and docking the national "One Belt & One Road" strategy proposed by Xi Jinping, Chinese President and making contributions to the construction of the China, Mongolia and Russia "One Belt & One Road" Economic Corridor. To this end, the persons in charge of World UnionPay and China Emperor Art Bank have recentlyinspected Mongolia. In return, the persons in charge of Free Trade Zones under the Ministry of Industry and Trade of Mongolia have also inspected China Shanghai Free Trade Zone, Mingzunhui Chinese Wine Financial & Culture Industrial Park and Wine Cellar Bank. On the basis of friendly negotiation, both parties have reached consensus about the "One Belt & One Road" economic and trade cooperation, decided to sign a series of cooperation agreements and established China, Mongolia and Russia Economic Corridor (Shanghai) Cooperation & Exchange Center. As convinced by both parties, the launching and settlement of China, Mongolia and Russia Economic Corridor (Shanghai) Cooperation & Exchange Center in Shanghai will inevitably lay a solid foundation for the fruitful achievements during the construction of China, Mongolia and Russia Economic Corridor. November 4 (infomongolia.com) Prime Minister Ch.Saikhanbileg, Head of the Cabinet Secretariat for Government S.Bayartsogt, Mayor of Ulaanbaatar E.Bat-Uul, Minister for Construction and Urban Development Z.Bayanselenge and Director of Water Supply and Sewerage Authority (Water Authority) S.Unen visited Central Waste Water Treatment Plant (WWTP) of Ulaanbaatar city on November 04, 2015. Mongolian government is renewing the Central WWTP within Ulaanbaatar Urban Development Plan for 2020 and 2030, and relevant working group was established on November 01, 2015 by the order of Governor of the Capital City and Mayor of Ulaanbaatar E.Bat-Uul. Current WWTP can process 170,000 cubic meter waste water per day removing 80-85 percent of all impurity from sewage. However, it was built during Soviet era and therefore designed for treating only household impurity. The new WWTP capable to treat industrial waste water is needed as industrialization is becoming important to Mongolia. Ulaanbaatar, November 4 (MONTSAME) A discussion about renovating and improving the Central Sewage Plant of Ulaanbaatar was held on November 3. As known, the UB City signed an agreement with the French Artelia Ville&Transport company on design and consulting for this plant's renovation project last July. During the discussion, the feasibility study was presented and reviewed by related officials. The currently operating sewage plant, commissioned in 1964, has a capacity of treating 4,500 cubemeter of waste water per day. The plant enhanced its capacity in 1979 and 1986, to a capacity to treat 150,000 cubemeter of only resident use waste water. The two extensions were made in accordance with the estimated load, however, the disposal load has reached 165-170 thousand cubemeters each day, of which around 40 percent come from factories and technological operations. Because of the excess pollution due to the insufficient sewage capacity, the UB city has been coming up with plans to renew the facilities, reflecting this objective in the Capital City's General Plan for 2020 and the Development Perspectives until 2030. Present at the event were a deputy mayor for ecology and green growth T.Bat-Erdene, a head of the UB City Investment Department L.Narantuya, also officials from the Water Supply and Sewerage Authority, scholars and water specialists. November 4 (gogo.mn) Governor of Ulaanbaatar City E.Bat-Uul received newly appointed French Ambassador to Mongolia Ms. Elizabeth Barsak. At the beginning of the meeting, Elizabeth Barsak said she is pleased to hold meeting with the Governor and exchanged views on certain matters. Governor of Ulaanbaatar city and Mayor of Capital City E.Bat-Uul mentioned: "You might be heard that one of the facing issues we have is water purification center in the city. We are determined to give an attention to the issue and to expand our cooperation accordingly. I am delighted that French company Artilla Villa Transport LLC is working on the redevelopment of the center and has already started creating its layout planning." Ms. Elizabeth Barsak in return said: "It is crucial to finalize the issue of the city's water purification center near future. We are open to cooperate and to deliver loans. Also, French Embassy is interested to organize environmental seminar jointly with Ulaanbaatar city administration." November 3 (gogo.mn) The signing ceremony of the first stage of Memorandum of Cooperation aimed at providing affordable housings for low income families (ger area families) which is being implemented by the Asian Development Bank in cooperation with the Government of Mongolia was held yesterday. MP and Minister of Finance B.Bolor, City Governor and City Mayor E.Bat-Uul and Director of ADB representative office in Mongolia Mr. Robert Schoellhammer have attended in the signing ceremony. "The main purpose of the Memorandum of Cooperation signed today is to construct affordable housings and public service buildings in strategically important ger-areas which provided sustainable engineering infrastructure. By implementing this project, affordable 10 thousand housings to be constructed and 130 hectares of ger-areas to be redeveloped", stated by the City Mayor E.Bat-Uul. Preliminary total cost for affordable housing project is expected at USD 500 million of which USD 350 million to be invested by the commercial banks and real estate businesses. Project feasibility study to be finalized in September, 2016 and the implementation process of project to start after the approval of the Government and BoDs of ADB in early 2017. Ulaanbaatar, November 4 (MONTSAME) A ceremony took place on Wednesday to open the Eco library-hall at the National Green Park in Ulaanbaatar. Launched from August of 2014, the hall's construction were performed by the National Green Park--state-run company and the "Mika Mongol" NGO, and this hall enables people to hold meetings, consultation, training and seminar on ecology, environment and sustainable development. The Eco Hall's activities will be focused on promoting people's education on ecology, presenting and propagandizing research and scientific works to the public, providing researchers and students with information and materials on environment and ecology and supporting activities of people and entities. During the opening ceremony, some scholars, researchers, representatives from the Ministry of Environment, Green Development and Tourism presented some books to the library. November 3 (UB Post) Car salesmen are protesting against the Ulaanbaatar Mayor's decree A980, issued September 30, which ordered the liquidation of seven auto markets. The A980 decree issued to move the construction material markets to Nalaikh and the auto-mechanics markets to 22-iin Tovchoo to decrease traffic congestion in the city center. The City Council decree No.29 instructs 22 entities to move as their market locations are deemed "unsuitable" for trade. The City Council has sent them notices to move but the traders are objecting and have started to demonstrate at Chinggis Square. 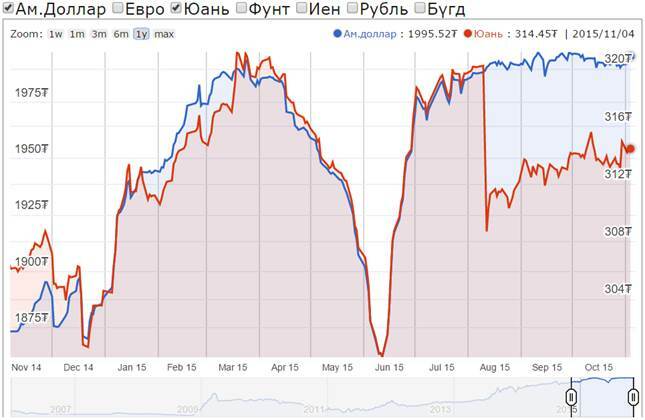 In the last four days, 1,000 Car Trade Market has stopped working due to forced move. In the 6,000 square meter space of the market, 300 traders used to conduct business. Last weekend,Ulaanbaatar Railway security closed the 1,000 Car Trade Market. On Monday morning, fire command, policemen, railway security and workers from the General Inspection Agency closed the market and didn't let traders enter. The traders believe this is an illegal action. "Even if we wanted to move to the auto mall, we don't have a place to get warm or even a restroom. Unless they improve the auto mall, we want to stay here until our contract expires. The contract will expire on November 2016. Also, the auto mall rent is very high. For us to move today, we have to pay four million MNT for parking spaces and then 1.5 to two million MNT for monthly rent. We also have to pay 500 MNT every time we come to work," said Ikh Tengeryn Khas Association member B.Uugantsetseg. Ch.Boldbaatar, Chief of the Ulaanbaatar Police Department, said they haven't received further instructions on closing other auto trade markets. "We have no other choice but to forcefully move the markets. We haven't received any orders to shut down other markets tomorrow," said an official of the Ulaanbaatar Specialized Inspection Agency. Ulaanbaatar, November 4 (MONTSAME) The marathon will start at 11 am on November 17, from the Chingis Square. This is to be organized in frames of the "Friendly Ulaanbaatar" program, run by the UB Mayor's Office, Department of Physical Culture and Sports and Mongolian Cycling Federation. Any man, woman and aged above 14 child can participate in the marathon. The organizers will hand out bibs. The 8km marathon route is Enkhtaivan (Peace) bridge--t120th micro-district--Zaisan--Ikh Tenger--Marshall's bridge--National Garden. The participants are obligatory to have bicycles with perfectly functioning brakes and other parts. Amateur cycling competitions will also begin at 11 am this Saturday at the National Garden, with classifications of age 3-4 (50 meters), 5-6 (50m), 7-8 (100m), 9-10 (500m) and 11-12 (1,000m) for children with boys' and girls' categories. Teenagers will also be divided into age groups--13-14 (3km), 15-16 (3km) and 17-18 (6km). The adult (from 19 to 60+) amateur competitions will be held on Sunday, starting at 11 am. The interested ones can register with their identifications, at the UB City Department of Physical Culture and Sports, between 9 am and 5 pm, starting today. November 4 (MONTSAME) President of the People's Republic of China Xi Jinping paid a visit to Mongolia in 2014. During this visit, the two countries established a memorandum on boosting the comprehensive partnership relations and reached an agreement about organizing a joint expo. By the agreement, a Mongolia-China expo was organized on October 23-27 in Hohhot city of Inner Mongolian Autonomous Region of China. The expo was attended by Mongolian delegation headed by Minister of Industry Mr Erdenebat and the private sector's representatives. The Minister said the signing of over 100 agreements in the mining, energy, industry and other areas will contribute to the economic circulation of Mongolia. Mr Erdenebat also exchanged views on the bilateral commercial and economic ties with the Chinese Vice Minister of Trade. The parties shared views about jointly participating in the China-initiated New Silk Road project which connects Asia and Europe, cooperating in the humanitarian and economic spheres, creating an economic corridor through Mongolia and mutual responsibilities in the project. In the scope of the project, a memorandum between the Mongolian Ministry of Industry and the China's Ministry of Trade will be signed by the Mongolian President during a forthcoming visit to China on November 10. The countries have concurred to organize the joint expo every two years, and the Mongolian Minister of Industry Mr Erdenebat said this expo is big chance for Mongolian companies to export their products to China rather than exporting goods to other countries. November 3 (Financial Times) Mongolia must be a candidate for the unwanted title of the country worst hit by cratering commodity prices and the slowdown in China. Coal, copper, iron ore, oil, gold and zinc account for the overwhelming majority of the landlocked central Asian country's exports (the next biggest category is animal hair), while almost 88 per cent of its wares are bound for neighbouring China. The slowdown in the global mining sector has also undermined foreign director investment flows into the Mongolian economy. Yet Moody's, the rating agency, believes it has at least found a crumb of comfort for the struggling, heavily indebted nation of 3m people. Anushka Shah, an analyst at Moody's described last month's visit to the country by Shinzo Abe, the prime minister of Japan, as a "credit positive". Mr Abe signed a series of infrastructure deals with Chimediin Saikhanbileg, his Mongolian counterpart, including the construction of a rail line to Tavan Tolgoi, one of Mongolia's largest coal mines, and an airport that will be constructed using concessionary funding from Japan. The possibility of Japan providing further budgetary support was also raised; official development assistance from Tokyo accounted for 37 per cent of assistance received by Ulaanbaatar in 2013, according to the OECD, making Japan Mongolia's biggest donor. Mr Abe's visit followed the ratification of a trade agreement by the Japanese parliament in May that will remove tariffs on 96 per cent of the country's exports to Mongolia within 10 years (up from less than 1 per cent currently) and ensure all Mongolia exports to Japan become tariff-free. "Deeper economic and diplomatic relations with Japan are credit positive for Mongolia," Ms Shah says. "Besides the longer-term benefits that will accrue from improved bilateral trade flows and funding assistance, tighter relations will support Mongolia's efforts to counterbalance its reliance on China and Russia for financial assistance and trade — the goal of Mongolia's so-called third-neighbour policy." Improved ties with Japan, while welcome, may prove a drop in the ocean, however. According to Moody's, bilateral trade between the two countries totalled $392m in 2014, some 4 per cent of Mongolia's total trade. Yet this trade is highly skewed towards Japanese exports, with just 0.4 per cent of Mongolia's exports heading in the opposite direction. Instead, as the first chart shows, 87.9 per cent of the country's exports are bound for China — far from ideal given the latter's slowing growth and its long-term shift from industrial development to a consumer society. The proposed budget support may prove more important than enhanced trade between the two nations. "Such support, if it materialises, would help limit Mongolia's external vulnerabilities, which have spiked meaningfully over the past year," says Ms Shah who adds that with reserve cover "thin", the country is increasingly reliant on a bilateral swap facility with the People's Bank of China to meet its financing needs. With debt repayments due in 2017, 2018 and 2022, Moody's' external vulnerability indicator, which measures maturing external debt payments relative to foreign reserves, stands at a worrying 203.7 per cent. "The numbers themselves tell you that default is a serious possibility," says Charles Robertson, global chief economist at Renaissance Capital. Figures from Fitch Ratings illustrate the scale of Mongolia's plight. As the second chart shows, the country has the second-highest net external debt to GDP ratio among the 108 states Fitch rates, at 129.8 per cent. Only Iceland has higher liabilities. Moreover, the third and fourth most indebted states by this measure, Greece and Cyprus, and well as the likes of Spain and Portugal, have the cushion of a powerful central bank buying up their debt, pushing down borrowing costs. Fitch expects this debt burden to ease only gradually, to 119.8 per cent of Mongolia's GDP by 2017, as economic growth slows from the 14 per cent it averaged from 2010 to 2014 to a level of about 4.5 to 5.5 per cent. Given the country's plight, Win Thin, global head of emerging market currency strategy at Brown Brothers Harriman, suggests Mongolia is heading for a downgrade. On BBH's own frontier sovereign rating model, Mongolia slipped two notches between the third and fourth quarter of 2015 to B minus, according to an update released last week. This is one level below Moody's' B2 and two notches below the B plus accorded by Fitch and S&P. BBH now accords Mongolia the third-lowest rating of the 37 frontier economies it rates, below the likes of Argentina, Mozambique and El Salvador, and ahead of only Lebanon (marginally) and Ukraine. "Mongolia has a strong downgrade risk," Mr Thin says. "They really benefited from the China story. Now growth has slowed and they have high inflation and current account deficits, the whole knock-on effects of low commodity prices. "It's a slice of what a lot of other countries are seeing, but Mongolia has a much shorter track record of dealing with this." Mr Thin says BBH's B minus rating "is not quite default territory, but it's close". His base case is that Mongolia will, if it chooses, be able to agree a programme with the International Monetary Fund to borrow money in exchange for reforms. In May, Mongolia did reach agreement with miner Rio Tinto on development of the second, $5bn underground phase of the country's vast Oyu Tolgoi copper and gold mine, a move seen as necessary for paying off or possibly refinancing international debt. However, there are concerns that a nascent split in Mongolia's governing "super coalition", which briefly united almost all of the country's 76 MPs, could further delay international investment into the $5bn Tavan Tolgoi coking coal deposit, the other big mining project deemed critical to Mongolian state coffers. ULAN, BATOR, November 3 (AP) – Sandwiched between China and Russia, landlocked Mongolia has long trod a middle path, maintaining a balance between Moscow and Beijing while referring to the U.S. and other remote allies as "third neighbors." Now, with a wealth of mineral resources set to transform its largely agrarian economy, Mongolia is moving to cement that even-handed status by adopting permanent neutrality as a safeguard against outside dominance. President Elbegdorj Tsakhia says the move will best serve a desire for peace, security and balanced foreign relations in the vast Asian nation of slightly under 3 million people (Mogi: passed 3 million already), while boosting its global profile in international organizations such as the United Nations. Draft legislation on adopting that status was submitted to the legislature last week. Mongolia's permanent neutrality will "contribute to the strengthening of peace, security and development in our region and the world at large," Elbegdorj said in a speech to the United Nations General Assembly in September. The building blocks of neutrality are already in place, with Mongolia legally eschewing nuclear weapons and military alliances. Mongolian officials say that since the collapse of former sponsor, the Soviet Union, in 1992 (Mogi: 1990), the country has been de facto neutral, despite close relations with the U.S. that have seen it dispatch troops and instructors to Iraq and Afghanistan. Neutrality imbues a country with protection for its territory and people as long as it refrains from involvement in armed conflict. Switzerland, Costa Rica and the Vatican City are the best-known adherents to that status, enshrined in the 1907 Hague Convention, with a long list of other countries having claimed neutrality at various times in their history. In his writings advocating neutrality, the Harvard-educated Elbegdorj has cited Mongolia's recent history, along with its geographic location and "the uniqueness of our chosen path of development." The country has plenty of cause to be wary of encroachments by its immediate neighbors. China is the country's biggest economic partner, absorbing 80 percent of its exports and providing 30 percent of its imports, along with more than $3.8 billion in investment. Russia, meanwhile, provides all of Mongolia's energy imports. Bonds forged during the Cold War, when Russia dominated political life there, remain strong, with Mongolia abstaining from a United Nations vote condemning Russia over its annexation of Crimea. Neutrality will end Mongolia's low-level engagement with NATO and the U.S. (Mogi: not sure about this), as well as precluding full membership in the Shanghai Cooperation Organization, a regional political and economic grouping that seeks to limit U.S. influence in Central Asia and is dominated by Russia and China. Mongolia has reportedly been invited to join the bloc, although the Mongolian leadership has been cool on the idea. "Our two neighbors are not interested in us getting close to the U.S. So, if our country becomes a permanently neutral country, we will get out of this pressure," said J. Baysakh, a professor of international relations at the National University of Mongolia. The law will permit Mongolia to retain its armed forces, and to join a military alliance in the event its sovereignty or independence comes under threat. Yet, the move has little value unless China and Russia rein in their diplomatic and economic pressure on Mongolia, raising doubts about the significance of the exercise, said Enkhsaikhan Jargalsaikhan, Mongolia's former representative to the Organization for Security and Cooperation in Europe. Mongolia's foreign policy already hews to the principles of balance, pragmatism and flexibility, Enkhsaikhan said. He questions whether Mongolians need to "limit our sovereignty voluntarily." Regardless, Mongolia seems intent on formalizing its neutral status following further dialogue between Elbegdorj and lawmakers and the passage of the necessary legislation. Foreign Minister Purevsuren Lundeg has already broadcast the country's intentions in visits abroad, including seeking neutral Switzerland's counsel. "Having permanent neutrality doesn't mean isolation from international community," said Choinkhor Jalbuu, director of the Mongolian Geopolitical Institute and former ambassador to the U.S. "In simple words, it is a position that Mongolia will not join any side against any country." November 3 (gogo.mn) Special forces from Mongolia and Turkey jointly organized military training titled "Nomadic Warriors – 2015" at open-field. The joint military training had continued for 21 days at training center of special army force. Two countries' joint military training was first held in 2006 and 2007 respectively in Turkey and planned to continue in 2008 in Mongolia. This year it was first training being held in Mongolia eight years later. From now on, two countries agreed not to postpone the training and to continue it in Turkey next year. Turkey officials highlighted that the joint training has been hugely beneficial and we are eager to expand our cooperation in the military. The defense industry is one of fundamental aspect in the two countries' cooperation. Minister of Defense of Mongolia Ts.Tsolmon paid official visit to Turkey last year and discussed about increasing number of Mongolian students studying military field in Turkey, expanding military cooperation, and restarting joint military training, with an increase in Turkey's grants to the army of Mongolia. Ulaanbaatar, November 4 (MONTSAME) The United Nations Conference Centre (UNCC) in Bangkok has hosted measures for presenting operations and goals of the UB-headquartered International Think Tank for Landlocked Developing Countries (ITTLDC). Co-organized by the Mongolia's Embassy in the Kingdom of Thailand and the International Think Tank, the measures have been held dedicated to those representatives who participated in the Fifth Meeting of the Asia-Pacific FDI Network held on November 2 in Bangkok, Thailand. The Permanent Representative of Mongolia to the Economic and Social Commission for Asia and the Pacific (ESCAP) Ambassador T.Togsbilguun has made opening remarks at the measures. His remarks have been followed by a speech of Dr Shamshad Akhtar, the ESCAP Executive Secretary and the Under-Secretary-General of the UN. Acting director of the ITTLDC Mr E.Odbayar has given a report on the governmental activities for supporting the ITTLDC, and presented a resolution of the UN General Assembly about backing the Think Tank's activities. He also reported about reasons of establishing the International Think Tank, its significance, purposes and actions. The measures have brought together some 50 representatives from landlocked developing countries, Ambassadors of Asia-Pacific landlocked countries to Thailand, diplomats; and department heads of the ESCAP. November 4 (infomongolia.com) On November 03, 2015, the State Secretary of the Ministry of Foreign Affairs, Mr. D.Gankhuyag has received Mr. Frantisek Dlhopolcek, the Ambassador Extraordinary and Plenipotentiary of the Slovak Republic to Mongolia, at the Ministry of Foreign Affairs on the occasion of ending his diplomatic mission to Mongolia. During the meeting, the sides reviewed the friendly relations between the two countries and talked about the prospects of further cooperation. On the same day, Deputy Speaker of the State Great Khural (Parliament of Mongolia), Mr. R.Gonchigdorj and Head of Mongolia-Slovak parliamentary group, Mr. J.Batsuuri received Ambassador Frantisek Dlhopolcek. Slovakian diplomat was awarded with a "Nairamdal" (Friendship) medal upon a Decree of the President of Mongolia in the scope of the 65th anniversary of the establishment of diplomatic relations between Mongolia and Slovakia for his valuable contribution to the diplomatic relations between the two countries. October 30 (president.mn) The European Parliament issued commemorative stamps and envelopes that carry photos of the President of Mongolia Tsakhiagiin Elbegdorj. The European Parliament publishes stamps with images of the Heads of State and Government who delivered speech to the European Parliament. President Elbegdorj visited Strasbourg, France and delivered speech to the European Parliament on June 9, 2015. Ulaanbaatar, November 3 (MONTSAME) The intergovernmental committee of Mongolia and the Russian Federation on commerce, economy, sciences and technical cooperation will run its 19th meeting in Chita of Russia on this November 23-24. The cabinet on November 2 approved the Mongolian delegation's guidelines to pursue at the meeting. The delegation will work for reaching agreements with the Russian side to open 50-100 billion RUB credit line to Mongolia within this year, to organize soon a meeting of the working group in charge of the renovation of Ulaanbaatar Railways and Strategic Partnership agreements, to get a deal to supply 106.6 thousand tons of wheat and up to 20 thousand tons of elite sort whole wheat from the bordering-with-Russia regions. The sides will also discuss organizing joint concerts and cultural events dedicated to the 95th anniversary of establishing diplomatic relations. The intergovernmental committee will touch upon matters on the cooperation in commerce, economy, infrastructure, mining, energy, transport and humanitarian works. November 3 (news.mn) On 31st October, Mongolian Prime Minister Ch.Saikhanbileg sent a letter of condolence to Russian Prime Minister, Dmitry Medvedev. In the letter he wrote: "We we shocked at the unexpected and sudden loss of the 224 passengers in the crash of the Russian passenger jet which happened in the territory of the United Arab Emirate. Please, convey my condolences on behalf of myself and the Mongolian Government to the people of Russia, in particular the families and relatives of the victims". November 3 (gogo.mn) In scope of Internet.org program initiated by Facebook company, Free Basics which allows people to browse basic services like weather forecast, news and horoscope for free is ready to launch in Mongolia starting today. APAC at Facebook and Mobicom Corporation are partnered to introduce this service in Mongolia and all you need is mobile phone which is able to connect to the internet (WAP phones can be used too) with a SIM card from Mobicom. Thus, we deliver you the interview with Ms. Anna Nygren, Head of Growth Partnerships, APAC at Facebook. - Hello, my name is Anna Nygren and I am working as Head of Growth Partnerships, APAC at Facebook. Our branch in Singapore work with different partners of region to bring Facebook and Internet to more people in Asia Pacific. So what is the internet.org? - Facebook launched this program with the aim to connect everyone to the Internet. Currently, 11 years old Facebook has more than one billion users. Now, Facebook is able to connect other people of the world that doesn't have Internet access through communications companies of local and region. Internet access enables number of opportunities to the public. For example: people are able to find job, get information and connect with their friends and families. That is why we introducing the FreeBasics in Mongolia. FreeBasics delivers basic services that people in Mongolia get access for free. We do this because we think its fundamental for people. We do research on a lot of people are not online and they do not use Internet because it is expensive. However, we find out they do not go online because they do not know why they should use. Most of people in Mongolia live in the rural areas. Is it possible to all of them to connect to the Internet? - Yes, as I said before we are partnering with Mobicom Corporation and if they have Mobicom SIM, they will able to use FreeBasics. If you have Android phone, download the FreeBasics application or if you have other types of phone, visit freebasics.com on your phone. How FreeBasics is going in other countries? - We launched it in 29 countries including Mongolia so far. We are really excited about the progress that we are making together with partners in the program. We are seeing very positive and strong results. The countries launched Free Basics, they bring more people online faster on to the network. In other words, the number of people using Internet in countries launched this service has increased by 50 percent. These people using free services but they also seen what the Internet can do. Beyond the free services, they are also paying for services. However there are still millions of people using the free service. They use free version of their local content provider and receive neccessary information such as weather forecast and currency rate for free. People using these services in their everyday life is positively impact on people`s lives while content partners are reaching lot more people. For example, in the Philippines, our partner talks about how people in the rural Philippines started to use Free Basics. Due to Phillippine consists of islands, it is difficult to go to school for students. However, students are getting an education within certain subjects through FreeBasics. It is a long journey to connect four billion people to online but we are seeing very positive impact already. In scope of Internet.org program, drones and satellites to beam Internet around the world has planned to be built. More on that work? - We do FreeBasics which is a center part of the Internet.org program that we launched it with the operators around the world. According to the research, roughly 85 percent of the world`s population are actually covered by a network coverage whether they are using 2G or 3G. That is why we provide FreeBasics to people covered by network. However, there are stiil many people who can not go online. For example, it is really difficult and expensive to build high quality networks which enable people to go online in countries which lead its population density like Dhaka, Bangladesh. So Facebook started to do research on other methods and try to find cheaper and more efficient way to connect. In the other hand, as in Mongolia wtih a big land and few people how do you connect them to the internet also requires efficient way. So we are looking into other technologies like using flying unmanned planes and drones. But these are still at their early stages and it will take some time until they will be commercially ready. South Korea is expected to launch 5G in 2017. Speed for network technology is increasing rapidly. Maybe one day we could watch video or see pictures for free. Is it possible? Today the services that we launch has mostly based on text. There is no advanced services included like video or web calling. Because users must receive services that is valuable for them. On the other hand, it has to be sustainable to the operator and other partners which are providing this service free for people. One example is that when ebola became big challenge in Africa, we launched service included information of what was the disease and how we prevent it etc.. and it was text based and it was high value for people to use. Is it possible to our local websites or local content providers to make contents to FreeBasics? - Of course. We developed FreeBasics into a platfrom. Anyone can go to developers.facebook.com/docs/internet-org and send their works to us. We will choose the valuable and neccessary information that is required for Mongolians and we will submit their contents and able to include it in the platform. Because there are so many useful information for only people in Mongolia which is different than people in Bangladesh or Peru. We really want to make sure that we can facilitate that local content relavent for people that can be included. Why do you choose Mongolia to launch this service? - Today there are many people who can not access to the Internet. It is expensive to go online for people in rural area and the only company which has high opportunity to connect regional users to network was Mobicom. How do you imagine the future of FreeBasics after five years in Mongolia? - We conducted research during last few months. Launching this service is considered as the biggest investment for telecommunication operator. Hopefully, I see all Mongolians will be connected to the Internet after five years. (Georgia State University) While practicing medicine early in his career, Erdenekhuu "Egi" Nansalmaa felt a calling to teach and realized he had greater healing to do. "You can be a good doctor and heal lots of people," said Dr. Nansalmaa, who treated trauma patients and performed orthopedic surgeries from 1997 until 2000 at the National Trauma and Orthopedic Research Center in Ulaanbaatar, Mongolia. But he decided that treating individual patients was not enough. "I devoted myself to public health because I thought I could help and serve many more people," he said. Nansalmaa wanted to improve education for new physicians and advocate for stronger health care policies in Mongolia. Along the way, his mission took him in front of national television cameras and finally to the office of dean at one of his homeland's leading public universities. But first, Nansalmaa went back to school to earn advanced degrees in medicine and public administration. In 2011, he earned his Master of Public Health degree in health management and policy from the School of Public Health at Georgia State University through the prestigious Fulbright scholar program. When Nansalmaa returned to Mongolia, he was met with many obstacles. Despite the country's transition away from socialism in the 1990s, doctors' salaries remained meager and hospitals struggled to find resources, Nansalmaa recalled. "It was very difficult," he said. "The doctors had to wash their hands with cold water because there was not hot water." One of Nansalmaa's successes in broadening Mongolia's understanding and support of public health was his creation of a broadcast television program. The "120/80 Health Program" features health professionals who are experts on various issues from maternal health care to cancer treatment in a talk show format. "In Mongolia, people don't trust hospitals," Nansalmaa said. "We wanted to change people's behavior by giving them more information. We also wanted to change doctors' and health professionals' attitudes by showing them who is doing a good job." Nansalmaa hosted the show for a year and a half but relinquished the role to focus on his growing workload as Dean for the Division of Medical Education Policy and Management at the Mongolian National University of Medical Sciences. His challenge now is to make health care education in Mongolia more engaging for students—"Not just lectures," he said—and measured more by competency than completion of hours. Nansalmaa also works with local advocacy groups in Mongolia to draft and push for insurance reform policies and mentors master's level students in hospital management and public health programs. Nansalmaa said his hope is that a stronger, better prepared public health system will help his homeland tackle its most critical health challenges. Chief among them is air pollution in the capital city of Ulaanbaatar. The city is ringed by mountains and contains a mix of modern buildings and nomadic housing, known as yurts. In the wintertime, which typically runs from October to March, yurt dwellers burn coal for heating and cooking. Over the years, the concentration of smoke within the city has become more and more dense—researchers consistently have ranked Ulaanbaatar among the worse cities for air quality—leading to greater instances of allergies, lung and heart disease, and cancer. "Not only can you see the pollution, you can taste it," Nansalmaa said. The government has instituted a program to give cleaner stoves to nomadic families, but the implementation has been slow. "If we don't strengthen our public health system, we will have lots of patients. Hospitals will be rich—and busy, too," Nansalmaa said. But the underlying health problems will remain. November 3 (UB Post) A new children's hospital, capable of serving 73,000 Bayangol District children from the ages of zero to 16, opened its doors on November 3. The Seventh Health Center building was repaired and renovated to become a children's hospital with 140 beds, funded by an investment from the district's local development fund. In recent years, the children of 15 khoroos in Bayangol District were forced to go to Songinokhairkhan and Khan-Uul District hospitals for care. "Bayangol District has a big population, so children's hospitals are never big enough. Over half of the district's children used to get treated at children's hospitals in different districts. This hospital is very useful, as it is serving the district's kids but also sharing the workload of other districts' hospitals," said Parliament Member S.Odontuya during the hospital's opening ceremony. The hospital is now capable of serving 60 percent of the district's children, said Seventh Health Center doctor B.Kuma. The hospital will provide in-patient treatment and service. It is capable of receiving 73,000 children per year. The children's hospital has diagnosis, treatment, rehabilitation, and emergency wards. In the teenager-friendly clinic, five functional wards for cardiac, dental, internal medicine, ear, nose and throat, and dermatology treatment are available. The experts and staff of the hospital have been trained for the new facility since 2013. A total of 50 doctors and workers are now starting to serve the public at Seventh Health Center. U.Batjargal, the head of the hospital, said that ninety-five percent of the staff is trained. "We opened our hospital before the common cold cases take place with the start of winter. The hospital is well equipped and furnished with beds, sheets, and equipment that is specially suited for children. We are also opening a center that conducts children's psychology and kinesiology, and provides rehabilitation so that we can discover disabilities in the earlier stages of development," said U.Batjargal. "By opening a senior rehabilitation center and a 100 bed children's clinic at the Sixth Health Center next year, the Bayangol District children's hospital's service will be 100 percent complete," marked S.Erdene, the Minister of Population Development and Social Protection, at the opening ceremony. November 3 (Outbreak News Today) 2014 was a brutal year for measles in the Philippines as the country saw more than 58,000 cases and 110 fatalities. For the first nine months of last year, the archipelago reported in excess of 53,000 cases and 102 deaths. For the first nine months of 2015, the Philippines has only seen 3,052 cases and three deaths. Dramatic. Much of this can likely be attributed to mass measles vaccination campaigns in September and October of 2014. In a follow-up to the measles outbreak in Mongolia, after reporting 20,010 cases during the first eight months of the year, September showed a dramatic slowdown of only 151 cases. (U.S. Embassy) From October 14 to 17, the U.S. Embassy in Ulaanbaatar sponsored the second annual EducationUSA College Fair- 2015 in Darkhan and Ulaanbaatar. Organized by local NGO Educational Advising & Resource Center (EARC), over 400 people attended the fair in Darkhan and 1,200 people attended in Ulaanbaatar. At the fair, EducationUSA advisers from China and Mongolia led sessions providing insight about the process of obtaining advanced degrees in the U.S. Embassy representatives delivered a country briefing to college representatives and a secondary school counselor presented perspectives from his work with secondary school students applying for universities. Chief Consul Tom Venner spoke about student visa interviews and Embassy staffer Uyanga Erdenebold introduced U.S.-sponsored scholarship programs, academic exchanges, and professional fellowship programs. Also, U.S. college and university representatives met with Mongolian high school counselors to discuss the application process and what admissions officers focus on in students' applications. Montana State University representative Brent Leavell commended the fair, noting that he was impressed by the level of English skills of Mongolian students and that attendees had done research on their preferred schools. EducationUSA is a network "committed to promoting the diversity of U.S. higher education to help international students find their best fit". In more than 170 countries around the world, EducationUSA has over 400 international student advising centers including EARC in Mongolia. To learn more about EducationUSA, visit here. (U.S Embassy) The U.S Embassy sponsored the National TEFL/5th Mongolia TESOL International Conference in Ulaanbaatar from October 9 to 11, 2015. Over 300 participants attended more than 70 workshops for 3 days at the Mongolian University of Science and Technology. Presenters included local teachers working in different provinces of Mongolia and educators visiting from China, Russia and Japan. The conference theme, "C3: Creativity, Communication and Collaboration" encouraged English teachers to share best practices and develop their professional networks. Dr. Mira, the President of the English Language Teachers' Association Mongolia (ELTAM), congratulated presenters and participants. In particular, Dr. Mira recognized 25 teachers from Khentii province for their efforts to develop professional skills and strengthen their collaboration in English education. Dan Sloan, an English Language Fellow based in China, gave a plenary speech at the opening of the conference and presentations about action research and methods to improve reading comprehension. English Language Fellows Meghan Fatzinger, Nicole Kaup and Christopher Ott led interactive workshops that focused on teaching through games and creative forms of classroom communication. On the last day of the conference, the U.S. embassy staff members introduced teachers to English resources provided by the Department of State. October 28 (Georgia State University, College of Arts & Sciences) For David Chiesa, an applied linguistics Ph.D. student, summer break was not much of a break at all. And he's okay with that. Chiesa spent his summer in Mongolia working as the country's first English Language Specialist for the U.S. Department of State, a position that would call for him to work long days and nights, 20-hour days to be exact. "It was really intense but I really thrived in the international environment. Although the amount of work was a lot, I enjoyed it" he said. "It's not just traveling. When you go, you really have to immerse yourself. You have to let go of any restrictions and throw yourself in." As an English Language Specialist for Mongolia, Chiesa trained English teaching assistants (ETAs) in the Fulbright U.S. Student Program, a program that places students in classrooms abroad to provide assistance to local English teachers. He created the Fulbright training program from scratch, teaching ETAs how to develop syllabi, understand the principles and procedures of Teaching English as a Foreign Language (TEFL) and increase their knowledge of teaching and assessing speaking, reading, writing and listening. "I developed the program in one month," he said. "The ETAs were a really bright group but they had no previous classroom teaching experience in second language education, so I had to delve in and teach them theory, methodology and techniques in only two weeks." Chiesa used theories and concepts he learned at Georgia State while in Mongolia. "I took a Georgia State class in second language acquisition with Dr. YouJin Kim, and a lot of the theories I learned in that course was incorporated into my training sessions," he explained. "Also, a class I took with Dr. Murphy on language teacher supervision provided me with a means to talk with other teachers in an appropriate way." Chiesa used the skills he learned in Dr. Murphy's class to assist him during his training sessions with Mongolian university teachers. "I'm into teacher supervision and teacher training, so I enjoyed working with the Mongolian university in-service teachers," he said. "To see their light bulbs go off, when some of them have been teaching for twenty years, was exhilarating. They were excited to learn." During his seminar, Chiesa taught the teachers how to create and sustain a collaborative language classroom, actively take part in learning, assessment and teaching strategies for the teaching of English and to use current research to prepare lesson plans. "I wanted to make a difference there, and I feel like I have so far but I still want to do more," he said. In an effort to do more, Chiesa is currently working on launching a Facebook group for the Mongolian university in-service teachers he worked with over the summer. The online community group will serve as a platform for the teachers to continue to learn under Chiesa's leadership. Also, Chiesa was invited back by the Regional English Language Officer (RELO), Kelli Odhuu, to return to Mongolia next summer to continue with teacher education. He hopes that Georgia State students will be inspired to pursue opportunities abroad. His advice: be flexible, go for it and find your passion! "If you want to experience something where you are totally out of your comfort zone, then you're ready for it," he said. November 3 (Valley News) In translation from the Mongolian, a proverb goes something like this: "Happy is he for whom guests are frequent. Joyful is he at whose door guests' horses are always tethered." On her first morning in the Upper Valley, Avirmed Khaltarkhuu awoke to discover how Vermonters welcome visitors from afar. Or at least how they do it at the home of Bob and Ann Claflin, her hosts for first half of her three months as an exchange teacher at Oxbow Union High School in Bradford. "I traveled 36 hours to get here," Khaltarkhuu recalled at the school recently, before showing Oxbow students how to make Mongolian-style dumplings in Wendy Mackenzie's family and consumer science class. "The next morning I was up at 6:30, helping out with their horses." That's when the 34-year-old stopped worrying about homesickness for her country, where she spent her childhood following her family's horses and livestock around the northwest corner of the country, and where she now teaches English at a vocational college. "I never miss home, because I'm very busy," Khaltarkhuu said. "During the day I have been observing all the classes, including English, French and German, teaching students about our food. And in the evenings. I listen to English conversation." Nor has she been sitting idle between times. "Did you have a good weekend?" Mackenzie asked before the cooking class. "I went out on the back roads, to look at the trees," Khaltarkhuu replied. Throw in a field trip with an Oxbow biology class to nearby Wright's Mountain, helping the Claflins teach horseback riding to kids, washing dishes at the West Newbury Church's turkey supper, extra-curricular outings to hike up mounts Cardigan and Moosilauke and to explore such White Mountains attractions as The Flume and Lost River Reservation, and she barely has time to enter her observations in tiny script into the modest-sized journal she carries everywhere. "We brought her here because we wanted to expose our students to another part of the world," said Oxbow English teacher Sharon Harkay, Khaltarkhuu's partner during the exchange. "She's been giving them that and more. "She's got a lot of energy." It runs in the family. "No tired," Khaltarkhuu said of her busy schedule. "At home, people walk from morning until night." That was news to most of the teachers and students to whose classes Khaltarkhuu, whom the students all call Ms. K, gave a PowerPoint presentation about her country perched on the northern border of China, and its customs. "They use their animals to move around," Kayleigh Trojanowski said while making dumplings in Mackenzie's class. "They pick up and move every so often." Khaltarkhuu roams a lot less back home these days — mostly helping her family in summer — now that she's teaching vocational students a language that she was still learning herself four years ago, until she met Anita Fahrni, a Swiss resident who runs an exchange program for Mongolian teachers aiming to improve their language skills. "This is her first experience outside of Mongolia and will certainly broaden her horizon and, of course, improve her English," Fahrni, who owns a vacation home in West Newbury, said in a recent email. "Mongolian teachers of English, especially in the countryside, have never had to speak the language. It is usually taught more or less in Mongolian. … This immersion in the language is of great importance to her." "For example, I learned 'finder's keepers/loser's weepers' and 'take it easy' and 'shall we go?' " Khaltarkhuu said. "The English I first learned was more British English, so some of the words are different. Some of the sounds are different. Sometimes, my pronunciation is wrong." "No!" Harkay insisted. "You're doing so well! Wait till you see me in Mongolia next summer." Khaltarkhuu, who started learning English at age 25, might not have made it to the Upper Valley at all, if an illness in her family hadn't prevented her from going to Switzerland for training and language immersion in Fahrni's program there. Before the Oxbow exchange was arranged, with financial support from Wells River National Bank and offers to host her from the Claflins and from Tom and Cathy Kidder of West Newbury, whom she will join next week, Khaltarkuu did receive a flood of books in English from Fahrni. They range among math, literature and grammar, which Khaltarkhuu said helped her own learning as well as her students. Among her favorites for recreational reading were "the Harry Potters." At Oxbow, she's seen a seventh-grade production of Hamlet, and finds teacher Ted Pogacar's English class "very interesting. He always has them discuss things, write essays, play roles." Khaltarkhuu also is watching closely how teachers put together and run their classes, and particularly likes the concept of bulletin boards. "I will tell other teachers back home what I've learned," Khaltarkhuu said. "I'll organize the class like Oxbow High School. I'm going to organize a little library where students can read a book and bring it home and bring it back." The more reports back that Fahrni hears from Vermont, the more she looks forward to continuing and strengthening an Upper Valley connection that began last year with a Mongolian teacher learning the ropes at nearby Blue Mountain Union High School in Wells River. "Although Avirmed is the one who profits most from this exchange," Fahrni said, "I feel certain that all of those in contact with her there, adults and young people, will learn a great deal." Wendy Mackenzie does every time Khaltarkhuu returns to the family and consumer science class for another cooking lesson. "We've had a few fun things with words," Mackenzie said. "We've had a few laughs about English usage, and the subleties of the language. Plus, she's a great cook, a real perfectionist. "It's been an awesome experience." To learn more about the Swiss Program for Language Instruction and Teacher Training, email a.fahrni@clinch.ch. November 3 (Embassy of Mongolia) The third Open Conference on Mongolian Studies was held at the ANU on the 3rd of November 2015. Keynote speakers included Igor De Rachewilz, Emeritus Professor, ANU, Professor Zayabaatar Dalai, Scientific secretary of the National Council for Mongolian studies and Mr John Man. The conference was organised by the Mongolia Institute, which was founded in 2011; and is one of four country-study institutes within the ANU, others being the Japan Institute, China Institute and Korea Institute. Since 2011, the Mongolia Institute annually organises the Open Conference on Mongolian Studies as well as the Mongolia update conferences. November 3 (UB Post) Director of the Mongolian Intellectual Academy (MIA) Kh.Khatanbaatar is well known to the public as an International Master of Memory. Last Sunday, the Mongolian memory team seized 19 out of 30 available medal sets from the 35th Memory World Championships in Taiwan. Kh.Khatanbaatar gave an interview about the impact of toys on children's upbringing and how people can improve their memory. Can you begin the interview by explaining photographic memory? Photographic memory is the ability to recall something a person has seen for a short period in high precision and detail. If we compare it to a camera, people with photographic memory take a snapshot of what they see immediately with their eyes and are able to recall it without losing information. I often hear about people with this kind of memory and I had an opportunity to personally meet a person with photographic memory. I've researched about the World's Fastest Reader, Howard Stephen Berg, who was recognized in the 1990 Guinness World Record Book for his ability to read more than 25,000 words per minute and write more than 100 words per minute. I've also researched about Daniel Tammet, who reads foreign language dictionaries like a book and speaks over 20 languages, and Kim Peek, who memorized 12,000 books and was the inspiration for the film "Rain Man". Some countries consider people with photographic memory to have been born with savant syndrome, where people demonstrate profound and prodigious capacities in music, mathematics or other areas. This syndrome occurs mostly in people with autism. Besides these people who are born with this ability, there are people who acquire exceptional memory skills through immense amount of hard work and effort. Mongolian athletes who are participating in international memory competitions are considered to have photographic memory. They demonstrate their nurtured memory skill by memorizing a full deck of cards in less than 20 seconds and memorize 30 digits in one second. This ability is the result of consistent training. You were able to make countless achievements by developing your memory skills. Are you able to recall things as if looking at a photograph? November 1 (UB Post) A loan officer who worked for a bank in Japan always found that the loans he granted were successfully paid on time. When he retired, he shared his secret. He granted loans only to women and, before making the final decision on the loan, he made sure he visited the home of the applicant to have a look at the state of their toilet, wardrobe, and kitchen. He had a rule, that if they were unclean or untidy, he would not approve the loan. The restroom (toilet) of a home or an office is a mirror that accurately indicates the culture, hygiene, state of affairs, and capabilities of its owner. It is time for every Mongolian to look at themselves, their neighborhood, and their country through this mirror, assess their living environment, and take measures for improvement. The central government and the majority of local governments have always avoided discussing the issue around toilets, let alone resolve it. As they've ignored the issue and pretended that they were not aware of it for many years, the general state of health in our society has triggered the alarm. One half of the three-million-strong population of Mongolia resides in Ulaanbaatar, whereas five percent live in Darkhan-Uul Province and three percent in Orkhon Province. More than half of those people live in ger districts. One third of the remaining population of 1.2 million resides in other province and soum centers, while approximately 750,000 people live in the countryside herding livestock and changing locations to seek better pastureland. Depending on their location of residence, 45 percent of our total population uses pit latrines by digging a hole in the ground and building a small shelter, either made of wood or covered by other found materials. Only around 65 percent of the population consumes water and food that has been sanitized. A United Nations report suggests that the thousands of new apartment blocks built in Mongolia's urban areas in the first 15 years of this millennia have caused only a three percent drop in the number of people who use pit latrines. I previously mentioned in my article "Potemkin Villages" that Mongolia is behind North Korea on access to improved sanitation facilities (flush toilets). Every Mongolian is aware that outdoor toilets (pit latrines) reflect a poor standard of living and wishes to make a change. However, no one is discussing how to solve this problem. Without using fancy terms such as restrooms or facilities, we need to bring this issue to light, talk about outdoor toilets, how they impact the life of an individual, as well as broader society, and hold a discussion about fixing the problem of their prevalence. Besides air and water quality, the hygiene of toilets used by a majority of the population is a key factor in the public health of a developing country. The outdoor toilets that are used by the majority of Mongolia's population, as well as the toilets in schools and kindergartens, are producing negative impacts on public health and the health of our younger generation. Are we going to do nothing and watch our children hold it in because they do not want to go outside to an unsanitary outdoor toilet in the cold winter and catch infectious diseases? Outdoor toilets allow flies to carry bacteria into food that can result in the spread of infectious disease. One of those bacteria is E. coli. If children are infected this bacterium, they will have to be treated at a hospital. However, complications from the disease can become recurrent unless the living environment is changed. As soon as the bacteria gets into the stomach and intestines of a child, it changes their body's immune system reaction and the infection can develop into a stomach disease. Recurring infection can lead to intestinal atrophy, which compromises the body's ability to get nutrition from food. It impacts the growth of a child. Due to heavy rain and floods, human feces contained in outdoor toilets rise to the surface and dry up, allowing bacteria to get in the air and transmit disease. We need to put an end to using outdoor toilets and upgrade the country's health and sanitation infrastructure. Until then, people should change their behavior. The risk of catching a disease from bacteria would significantly be reduced if everyone frequently washed their hands. Local health institutions, such as soum and district hospitals, need to take action to raise awareness of the bacterial concerns of outdoor toilets and the benefits of washing hands frequently. It is obvious that preventing disease is much cheaper than seeking treatment after becoming ill.
Khuvsgul, the outlying province with the biggest population, has started some initiatives to improve the conditions of toilets used by children. Even though 70 percent of children go to kindergarten, the capacity of their buildings is low. One kindergarten class in Murun, the province center, has 30 to 40 children enrolled, which is twice as many as the guideline given by the ministry. Most of the kindergartens of Khuvsgul's 24 soums use pit latrines located outside the building. A winter in Khuvsgul can get as cold as -40 degrees Celsius, so the toilet situation has a significant impact on the health and comfort of small children. Tunel has a population of 3,800 and its only kindergarten has 175 children. During the summer, they operate a mobile kindergarten to accommodate the children living in the countryside in remote bags (an administrative unit smaller than a soum). The United Nations Children's Fund (UNICEF) gave an air conditioner and an improved outdoor toilet to Tunel's kindergarten. UNICEF also donated modern toilets and showers installed in a freight container to the male and female dormitories of Tunel's high school. UNICEF is implementing an experimental project to replace outdoor toilets in Khuvsgul Province and aims to extend it to other provinces. They built 26 improved toilets, each of which cost approximately 25 million MNT, for school dormitories and kindergartens in 12 soums, 13 container toilets (60 million MNT each), and eight modern toilets with plumbing. They had to dig wells in six soums. The project costs 1.2 billion MNT in total. Local governments and teachers have been talking about how the project is bringing a significant improvement to the living and learning environment of the children who used to go outside in the dark, cold winter to go to the toilet. The province government is also working alongside UNICEF, and has been allocating funding from their local development fund to improve the toilets in province soums and in Khatgal soum. In the mid-19th century, England had the "Great Stink" caused by untreated human waste in the River Thames. London solved the problem by gradually replacing the city's infrastructure. It helped the average life expectancy increase by ten years and changed the behavior of city dwellers. Similarly, building low cost, improved toilets will influence public health positively, while working on the more long-term program to replace the whole ger district with apartment blocks. Outdoor toilets today are causing children to catch diseases and restricting them from growing up healthy. In order to have the city's toilets meet the needs of today, it is time to launch a modern toilet infiltration initiative to improve public health, similar to the cultural infiltration that happened 50 years ago. RENO, Nev., November 2 (MyNews4.com & KRNV) -- The future of the Nevada drone program has officially taken flight. Last month, Business Director of the University Of Nevada, Reno's Nevada Advanced Autonomous Systems Innovation Center, Warren Rapp, joined professors from various UNR programs on a trip to Mongolia. "There was extreme excitement," says Rapp. "You couldn't have picked a nicer, more beautiful place to fly your UAV." The program is ten years running, but this is the first time drones and the NAASIC Center are being incorporated. "That's a whole game changer," says Hydrology Professor Scott Tyler with the Geology department. "You can now start to measure things with really high frequency and really high resolution." Tyler and Rapp left Reno for Mongolia in late September to continue a decade long study of the worlds largest fresh water trout in Mongolia's Egg River. In the past, researchers and scientists have monitored the fish by catching them, documenting the trout and tagging them for future evaluation. This year, Nevada drones captured video above the river, showing not only how many fish exist, but their traits and lifestyles too. For years, UNR Associate Professor of Limnology Sudeep Chandra has been comparing rivers and lakes from across the world with bodies of water in the Sierra, including the Egg River and the trout living within. "By studying these systems that are not heavily impacted, perhaps we can use that information to restore the Truckee or Carson River," says Chandra. New Federal Aviation Administration regulations allow UNR to use their drones over the Truckee River. "Working in other countries can bring information back here," says Chandra. "Also, the technologies we develop here at the University of Nevada can help other countries conserve other resources." Rapp says he's excited to take this practice to the Truckee River and study the largest local trout, the Lahontan Cutthroat spawning from Pyramid Lake. "There is obviously going to be some publications that come from this and the sky is the limit on where we can take this," says Rapp. "Not just within Nevada, but across the globe." Reporter Ryan Kern takes us up in the air and overseas this November on News 4. Bonn/Tashkent, 2 November 2015 – At a UN backed meeting organized by the UNEP-Convention on Migratory Species (CMS) from 26 to 29 October 2015 in Tashkent, Uzbekistan, governments and conservationists agreed on a concrete set of measures to restore saiga populations in Kazakhstan, Mongolia, Russia, Turkmenistan and Uzbekistan. More than 70 participants attended the Third Meeting of Signatories to the CMS Memorandum of Understanding concerning Conservation, Restoration and Sustainable Use of the Saiga Antelopes (Saiga MOU), which was hosted by the Government of Uzbekistan. Latest figures presented at the meeting show that more than 150,000 adult saiga antelopes died during the mass mortality event which hit the species in central Kazakhstan earlier this year. The catastrophic collapse of this already critically endangered species has halved the global population size of this iconic migratory species of the steppes and deserts of Eurasia. New survey data also showed that the transboundary Ustiurt population between Kazakhstan and Uzbekistan is at the brink of extinction, not least due to a border fence and railroad dissecting the migration. These findings are a major blow for conservation efforts given that saiga populations were only just recovering from an all-time low of less than 50,000 animals at the start of the century following a 95% crash in numbers. Prospects for recovery of the species are being hindered by infrastructure developments such as railway, roads and border fencing which are obstructing part of the saiga's migration. Continuing poaching and illegal trade in and beyond range states pose additional threats to the species. CMS Executive Secretary, Bradnee Chambers stated: "This has been a catastrophic year for saiga antelopes. We have lost half the global population as a result of the mass die-off in May and I am devastated to learn that one of the transboundary populations is at the brink of extinction. Exceptional efforts will be required to restore the populations and we are pleased to see that countries in the region have agreed on strong actions in Tashkent to tackle the many challenges ahead." One of the key outcomes of the Tashkent meeting is the review and adoption of a detailed set of measures until 2020 for Range States and consumer countries. This includes the alteration of border fencing and infrastructure obstructing saiga migration, anti-poaching action and strengthened wildlife health management. The process of regular national reporting by signatory states was updated to ensure that progress and compliance with the Saiga MOU can be measured effectively. An overview report on the current conservation status of the species across all range states was reviewed and adopted. November 4 (Evening Standard) An appeal has been launched to help reimburse a Mongolian footballer who was defrauded of nearly £4,000 by a fake agent. Manchester United fan Ochiroo Batbold was approached on Facebook by a man claiming to have links with West Ham United and Los Angeles Galaxy. The fraudster claimed to have watched videos of him playing for amateur side Bayangol and told him he could secure him a trial in the USA. The 17-year-old was told to pay a sum of $6,000, which represents over a year's salary for his parents, to secure his place with the MLS side, only discovering that he had been scammed after showing a member of club staff the fake contract he had been sent. He was also asked to provide further money to insure himself against injuries on his 'trial'. Ochiroo shares a one-room yurt with three other family members in Ulan Bator and his parents had taken out a loan for what they believed would be their son's big break. They now face the prospect of losing their home if the appeal does not reach its £3,800 target. Paul Watson, the English co-owner who set up Bayangol in 2013, told Standard Sport: "We're hoping that fundraising may give Ochiroo a second chance. "Right now he's very depressed and the family are desperate, the guilt is eating Ochiroo up and he's even considering quitting football. As a club we are doing everything we can to help but we are relying on the good nature of genuine football lovers to help." Watson, who has also coached the Federated States of Micronesia football team, was left hugely disappointed at the plight of Ochiroo. He described the youngster as the sort of player that he had founded the club for. "We were told that there was a 17-year-old called Ochiroo who would routinely train on his own at 6am on -20 degree winter mornings in Ulan Bator. His school gave him the keys so he could open up the school gym and boot a ball against the wall. "We paid him a visit and were bowled over by his passion and potential. His idol is Wayne Rooney and he always wears a Man United shirt and watches every United game with the Mongolian Man United fan club at a pub in Ulan Bator. "Ochiroo joined our team and for two years has been the most dedicated player you can imagine. He's always the first to turn up to training and the last to leave, plus he's always smiling on the field. Everyone in the squad loves him. He played a crucial part as Bayangol won the Mongolian Amateur Championship this year." In 2013 the FA warned young players of the risk posed by fake agents, encouraging any aspiring footballers to confirm the details of anyone contacting them on Fifa.com. The individual alleged to have scammed Ochiroo had pages on Facebook and footballscout.com. Police in the USA and Mongolia are currently investigating the crime but Watson and the family do not expect to get their money back even if the fraudster is caught. The appeal has currently received £155 of its £3,800 target. If you wish to donate you can do so through the Justgiving page. Ulaanbaatar, November 3 (MONTSAME) The International Judo Federation (IJF) Sunday released the latest rankings of judokas just after the Abu Dhabi Grand Prix tournament held last weekend in the United Arab Emirates (UAE). According to the rankings, a bronze medalist of the 2015 World Championship D.Sumiya IMS led the ranking of the women's 57 kg weight category with 2,451 points, surpassing a Romanian judoka Corina Carrioriu (2,370 points). A State Honored Sportswoman M.Urantstetseg still topped the women's -48 kg category, having 3,178 points, whereas D.Tomorkhuleg went down to second in the men's -66 kg division. A gold medalist of the 2014 World Championships G.Boldbaatar went up to second in the men's -60 kg, while his countryman D.Amartuvshin fell to ninth place. An international master of sports Ts.Munkhzaya (woman) has kept her seventh place with 1,759 points. November 3 (infomongolia.com) The First Taiwan Memory Championships 2015 was held from October 31 to November 01, 2015 in Taiwan. 81 memory athletes from 12 countries competed in three age categories on vision and hearing contests for the first place. Mongolian mental athletes, International Grand Master of Memory (IGM) U.Sengesamdan, Grand Master (GM) S.Tsogbadrakh, Junior World Champion T.Enkhjin, Asian Master (AM) A.Anudari, M.Tuguldur, E.Yalguun, Sh.Shijir-Od, M.Tamir headed by trainer B.Baasandorj, have brought 38 medals out of 70 possible medals. Thus, Mongolian team has topped ranking list of the First Taiwan Memory Championships 2015 by total medals won: 20 gold, 4 silver and 14 bronze medals. In addition, S.Tsogbadrakh could broke his own world record in contest of "Spoken Numbers" by memorizing 432 digits, previous record was 390 binary digits. The 2015 Taiwan Memory Championships is a preliminary competition for the 24th World Memory Championships to be held from December 16-18 in China. November 1 (UB Post) Artist of the State Academic Drama Theater Ts.Tserenbold has been cast as Chinggis Khaan in the second season of Netflix's "Marco Polo" series. On October 30, Ts.Tserenbold uploaded pictures of himself captioned, "Me as Chinggis Khaan in the second season of 'Marco Polo' series," on his Facebook page. The second season of the popular web series is expected to premiere later this year. Ts.Tserenbold has been performing at the State Academic Drama Theater since 2006. He has played main and supporting roles in historical and classic plays, namely "Atga Nuj" by B.Lkhagvasuren, "Amidral Chinii Tuluu" (Life for You) by D.Enkhboldbaatar, "Nuuts Amrag Chin Boloy" (Let Me Be Your Mistress) by S.Jargalsaikhan, and "Anu Khatan" (Queen Anu) by B.Shuudertsetseg. He has appeared in more than 10 films, such as "Dev", "Father", and the historical film "Aravt". Ts.Tserenbold won the best male protagonist award at the Mongolian Academy Awards 2015 for his role in "Father". Mongolian actor B.Amarsaikhan starred in the first season of "Marco Polo". He played the role of Arig Bukh. The first season of the series premiered on Netflix on December 12, 2014. November 3 (UB Post) 23-year-old Mongolian producer L.Nyamjargal opened a film studio in Hollywood earlier this year. Currently, there are some 8,000 to 9,000 film studios in Hollywood, and L.Nyamjargal is striving to compete by producing Mongolian films. The new film studio, Mongus Pictures, was co-founded with film and television producer Patrick G. Ingram. She explained that she named the studio Mongus Pictures with the hope to produce films with Mongolian and American teams. The word "Mongus" was created by joining "Mongolia" and "USA". L.Nyamjargal moved to the USA at the age of 10, and from a young age, she has been captivated by films and television shows. She got her current job at Sony Pictures Entertainment Inc. after graduating Columbia College Hollywood. The young filmmaker produced more than 30 short films in college. Last month, L.Nyamjargal briefly visited Mongolia. During her visit, she gave an interview about herself and briefly spoke about the difference between Mongolian and Hollywood film studios. You did an internship at the famous Paramount Pictures. Does every student at the Columbia College Hollywood get this type of opportunity? How were you chosen? I believe it was a very lucky occasion. An examination is required for doing internships at large studios. During sophomore year, I passed the examination, received a grant and got to work at Paramount Pictures for a year. I completed my internship under Rosser Goodman, CEO and director of KGB Films. I gained experience by joining and working with various teams. I even worked with the design team. I tried working on feature length films from 2013. You became a professional director and producer. Which occupation do you find more interesting and suitable for you? People have to gain different types of experience and become versatile. We have to constantly advance forward. Most recently, I worked as a coordinator for a television series at Sony Pictures Entertainment Inc. I will work hard to become a prominent producer in the future. Directors have to have a lot of experience. Will you start directing when you're a little older? I think that I'll need more life experience and good vision to direct a film. The vision of a 23-year-old isn't very profound. A film production needs to reach the hearts of viewers. For that reason, experience is very important. What kind of short films did you make in college? From scary zombie plots to comedy romance, I've made all sorts of short films. Two films I filmed were nominated at the Cannes Film Festival. That was the first time that a production of a Columbia College Hollywood student was nominated for this festival. These films were directed by my Mexican friend. Did you work on a film production during your visit to Mongolia? Yes, I worked as a foreign relations manager for a new film, "Algand Uldsen Erdene", by Khuvisal Production during my visit. Is working with a Mongolian team different from working with an American team? It's different. In the USA, people only have to do what they've been assigned, but in Mongolia, one person does the job of 10 people. Were the film equipment different from the USA's? Khuvisal Production's equipment, writing and editing software, camera and lighting were different from the ones I use in the USA. As it's possible to bring those equipments to Mongolia, I don't think there will be any problems. Do you think that Mongolia is capable of producing films that can compete globally? Mongolians don't lack anything. All they need is to expand their knowledge and be able to work consistently to international standards. Obviously, the Mongolian and American film market is different. As the population of the USA exceeds 300 million, producers have to wait one or two years until their film is screened. But in Mongolia, films can be screened immediately after one or two months of filming. Mongolian artists and producers are talented. Is it true that cinematographer D.Angarag has signed a contract with Mongus Pictures? D.Angarag and I met by chance, and we will be working together in the future. I have made it possible for him to work as a freelance artist in the USA under my company. It doesn't mean that D.Angarag will have to work for Mongus Pictures. We've negotiated so that he can openly work with American film artists. This is the first time we have enabled a Mongolian artist to work in his field in the USA. We will make this opportunity open to many more artists in the future. Gathering the necessary documents is quite tricky. But I'm sure I'll be able to fulfill my dream and work with Mongolian artists in the USA soon. I also want my company to become the best in Hollywood. I have to become a prominent producer and recruit a team. Film art is something that can only be produced with teamwork. November 3 (UB Post) A short film by Mongolian National Public Radio and Television (MNB) "I'm Mongolian" won the special jury prize at ABU Prizes 2015, organized by the Asia-Pacific Broadcasting Union (ABU), held in Istanbul, Turkey, on October 30. "I'm Mongolian" was directed and produced by O.Enkhbold, and edited by Kh.Shine-Od. The film is about an Inner Mongolian woman, G.Chimedtseren, who wants to become a citizen of Mongolia. In the film, she comes to Mongolia on a camel with her father and stepmother at the age of 11. The five-minute film tells the story of her 44 years without any rights to receive medical care, to be paid for labor, or to take part in elections. "I used the recordings I captured to create the Mongol Music Archive as my undergraduate thesis. After graduating in 2014, I decided to take a break from music and moved to rural southwestern Colorado to learn to wrangle horses on a dude ranch. After that, I used the money I had made to travel around Thailand and Laos, and then to Lander, Wyoming, to work for the National Outdoor Leadership School. Now I'm back in Mongolia." "... is to capture everyday uses of traditional music in the daily lives of Mongolian herders. As a general shift from nomadic to industrial and urban lifestyles occurs in Mongolia, it is important to capture these moments and performances. While traditional music will remain part of Mongolian culture with or without nomadic herding, these performances exhibit something that staged performances by professional musicians cannot. Herders sing about actions they carry out on a daily basis, the environment they inhabit, and use songs as tools to calm and train their animals. This project aims to preserve a specific aspect of Mongolian music to serve the tradition as a whole." An example of Staszewski's work is recording Mongolian herder-singer Tseveng, known in the community for singing traditional folksongs. Herders and livestock production are in the heart of Mongolia's economy, but harsh climate conditions and the country's recent transition from communist control to a market economy have made it difficult for some herders to maintain their traditional way of life. Ethnomusicologists, such as Carole Pegg, have been researching the use of "overtone singing, whistles, vocal calls, melodies, flutes" both to coax and control animals and entertain herders. She points out that the name for the West Mongolian fiddle, "ikil," may be derived from "ih hel," or "large language," that is, one superior to ordinary language. Of widespread ancient customs communicating with animals through a musical language, Mongolians may have the few remaining working communities to preserve the tradition that's the subject of Staszewski's work. The Fulbright grant announcement says: "As the performance of traditional Mongolian music becomes dominated by staged performances by professional musicians, Dimitri's website will highlight an underrepresented and disappearing group of performers. He hopes the website will become a valuable resource and source of inspiration for academics, musicians, and music enthusiasts worldwide." November 3 (Travel Biz Monitor) Mongolia considers India as an important partner for tourism. This was shared by Gonchig Ganbold, Ambassador of Mongolia to India at an interaction held at Indian Merchants' Chamber in Mumbai last week. "There's great scope for tourism exchange between the two countries," he stated. The mineral rich country sends many tourists to India; most of them come for religious purposes. "Mongolia considers India as the sacred land of Buddha. Many Mongolian citizens come to India to become monks," the Ambassador shared. For Indian visitors looking to travel to Mongolia, the visa process is quite relaxed. "We have liberal visa regime for Indian passport holders, we do not charge any visa fee," he said. Mongolia is home to many Indian restaurants. English is widely understood and is the second foreign language in the country. The country offers snow capped mountains, forests and a peak into nomadic life. November 4 (ITCM) Air Astana, Kazakhstan's Skytrax award winning national carrier, returns to World Travel Market this week at London ExCel Centre, exhibiting alongside representatives from the country's Ministry of Investment and Development, Tourism Department. Stand AS670. It will be promoting a new direct route to Mongolia's capital city, Ulaanbaatar from Astana, which features good connections from London Heathrow and its European network. The route commences at the end of March 2016 with lead in return fares from London at £533. Tickets are available for booking on the Air Astana website www.airastana.com. And it has already attracted interest from several UK tour groups who are constantly on the lookout for somewhere a little different for their clients. Ulaanbaatar is the cultural, industrial and financial heart of Mongolia where travellers can experience the country's rich cultural heritage in the museums, palaces and monasteries such as Bogd Khan's winter palace and Gandan monastery. Outside the city, the vast desert, picturesque steppe and rugged mountains offer a novel destination for travellers who like adventure. Camping, horse trekking and hiking are all on offer, complemented by country's welcoming nomadic hospitality. November 3 (Nikkei Asian Review) "Only the toughest survive here," writes photojournalist Palani Mohan in the introduction to his extraordinary photography book, "Hunting with Eagles: In the Realm of the Mongolian Kazakhs." His reference is to hardy Kazakh tribesmen of westernmost Mongolia, who brave sub-zero temperatures to hunt in the ancient manner, using eagles. But he could easily be including those -- such as himself -- who try to document the intriguing practice. Mohan, 48, was born in India, raised in Australia and is now based in Hong Kong. His past books include "Vivid Hong Kong," "Hidden Faces of India," and perhaps the definitive study on Asia's largest and best loved animal, "Vanishing Giants: Elephants of Asia." His pictures also run in such publications as National Geographic, Time magazine and Stern. His latest project challenged not only his photographic skills but his very endurance. Kazakhs are a scattered people, with about 15 million mainly living in Kazakhstan, but also in parts of China, Central Asia and westernmost Mongolia. The last, he explains, is a stunningly beautiful but inhospitable land, with few roads or modern conveniences. The old-fashioned eagle hunters dwell far off the grid, amid expansive landscapes of grassland framed by snowy peaks, surrounded only by their families, their livestock that sustains them, and the majestic birds that are so much of their heritage. Falconry is celebrated across the Asian steppes, as far afield as the Gulf and Morocco. Genghis Kahn was an avid fan, and as he conquered the globe, likely helped propagate the practice. Historians believe falconry originated in this very region thousands of years before, perhaps as early as 4000 B.C. Scenes on shards of ancient Central Asian pottery depict falconry as a royal custom, and paintings from the Tang Dynasty show it spread to the Imperial court in China. Much later it became a passion in Europe and the Middle East, spurred by the Mongolian conquests and the crusades. Mohan's book not only details the colorful traditions among eagle hunters in western Mongolia, but his own personal crusade to document the practice. Others have covered eagle hunting among Mongolia's Kazakhs as well as in China's Xinjiang Province, but few have so passionately detailed the intimate connection between hunter and bird, man and landscape, and, ultimately, photographer and his fascinating subjects. Mohan's lush prints are exquisitely presented in stark black and white duotone, a process that overlays the monochromatic images with another in grey. The resulting pictures are sharp in detail, yet look atmospherically aged, as if from a history book. Most compelling are his portraits, depicting proud, fur-swathed Kazakhs posing with regal birds. Mohan also presents a rich panorama of landscapes from many angles, along with wonderfully varied scenes of the craggy hunters with their families and the livestock -- a comprehensive picture of life in this rugged region. Mohan spent several years on the project, repeatedly braving bracing temperatures to visit the same group of hunters in western Mongolia. Simply getting there required fortitude; photographing the project not only tested his grit, but even his equipment. He describes it as the culmination of a quest that began decades ago. While still a young newspaper photographer in Australia, Mohan first saw pictures of the hunters, from a festival held each summer in Olgii, the provincial capital of western Mongolia. Thus was planted the seed of the book. "I didn't just want to show up at the festival. I wanted to follow them around," he explains. "I wanted to really soak up a sense of their lives, spend time in their homes, get close to them." The project took him far outside any comfort zone. Hunting traditionally takes place in winter. That is when the favored prey, the corsac fox, with its distinctive reddish fur, stands out against the fresh snow. "This was one of the hardest things I've ever photographed due to the cold," he recalls. "I slept with the batteries under my armpits in bed to try and keep them warm," he says. "When I was working, I had on so many layers, it was hard to do anything. I've never photographed in such low temperatures; it was hard going." Connecting with the nomadic hunters was another ordeal. "Traveling in that part of the world takes forever," says Mohan, chuckling at memories of the hardships, careening around in unheated old jeeps over terrain with no roads. "And when you get there, the people have already moved on!" Eventually he connected with Orazkhan Shuinshi, an elder of a dwindling band of the traditional hunters. The book describes how younger generations have turned away from the daunting challenges of finding, feeding and training the eagles. Birds are taken at a few years of age, then hand-fed, helping to forge a bond that lasts through 10-15 years of hunting. After that, the eagles are released into the wild. "Every year, when I went back, more hunters were gone. I wanted to document them before they vanished." He recounts his last visit: "As I was saying goodbye to my friend Orazkhan, he took my hand, wished me a safe journey, and said, 'It was good to see you again. It will be my last time, I think, as the next winter will get me.'" This book provides a rare look at the intriguing Kazakh eagle hunters and, in its own way, tries to ensure that their legacy will live on. November 3 (UB Post) Tourism is the most appropriate sector for developing the nation's economy at a low cost. A Mongolian saying tells us that moving big rocks with small ones is possible. For Mongolia, tourism is a sector that could greatly contribute to the country's economy and draw in currency with low overhead expenses. Mongolia would be able to just show off its natural beautiful landscapes to foreigners to collect money. However, nowadays tourism attractions are not only assessed by the beauty of landscapes. In every corner of the world, countries are coming up with lots of new ideas and organizing events and promoting their unique features to attract the world's attention. Of course, summer is the most suitable period for tourism, but for Mongolia – which has harsh weather for more than half of the year, what are solutions for not being left behind in tourism's development? Mongolians organize winter events in places that are difficult to reach, or that are expensive to get to. As a result, tour operators have no interest in winter travel, as they usually spend a lot of money and don't earn enough to cover expenses. But if Mongolians cannot come up with new ideas, let's learn from our neighbors. For instance, Harbin is a city colder than Ulaanbaatar, but they have been organizing ice and snow festivals for over 30 years. Statistics show that over ten million tourists visit the city to see the festival. This is a prime example of how the world is interested in the tourism attractions of our neighbor. Originally, Harbin's ice festival was organized with only domestic visitors in mind. Statistics also show that the festival earns more than triple its costs. Russia has been organizing similar events in several cities each winter. The first-ever Russian winter festival took place in 1923. Even though there are a few events aimed at developing winter tourism in Mongolia, including an ice festival and eagle festival, the scope of these events is really narrow. Not only foreign but domestic experts have been critical, saying that usually the organization of these events is awkward and messed up, even though they could have involved more of the public. Companies engaged in tourism stress that Mongolia needs an integrated policy and system for developing winter tourism, and to determine policy for what kind of products and services would attract tourists. Of course there are difficulties, but delivering the message that Mongolia is a cold country with -30 degree Celsius weather in wintertime, large snowfall, and a harsh climate leads to the negative impression among foreigners that Mongolia is a really cold country. Tourism companies also have summer-only tour programs, so winter tours are left behind in development. Tourist camps close their doors in wintertime. In order to develop winter tourism, the government could select one tourist camp in every region and exempt them from taxes, and the selected camp could provide services at a discount during winter. Businesses also suggest that the government could also provide support for building ski resorts that meet modern standards and requirements by issuing concessional loans with low interest rates. Even though there are reports that over 80,000 tourists visit Mongolia in wintertime, in reality, the figure hits only 40 to 60 people every year who come here to engage as tourists. Currently, Mongolia's winter tours only include the ice festival of Khuvsgul Province, the camel festival of Umnugovi Province, and the eagle festival that is organized at Chinggis Khuree Camp. Tourism companies underline that even though they try to organize these events on their own, their situation is worsening from year to year. Because the government does not provide them with any assistance, event organizers lose their motivation and desire for organizing such events. One of the most important parts of a winter tour would be Tsagaan Sar (the Mongolian lunar new year). Even though Mongolian Tsagaan Sar takes place around the same time as Chinese lunar new year, Mongolians need to promote that our traditions and customs are different from China. Mongolian tourism companies that participate in international tourism trade fairs like International Tourism Exchange (ITB) or World Travel Market (WTM) should also promote winter tours, providing visitors with attractive information about Mongolia. Undesnii Shuudan spoke with major representatives from the Mongolian tourism sector to ask for their suggestions. Director of the Mongolian Guide Center Ch.Buyanbadrakh: In recent years, tourism has been directed toward Asia-Pacific countries, and this is also a positive trend for Mongolia. Tourists who visit Mongolia usually pass through China. The number of tourists visiting China has been increasing by eight percent every year, and Mongolia needs to take advantage of that pleasant situation. In order to develop winter tourism, Mongolia could organize tours for horseback riding, camel treks, dog sledding, skiing and skating, ice climbing, and overnight stays in Tsaatan camps. Moreover, tourists could be introduced to the way Mongolians celebrate the new year, and in addition to Tsagaan Sar, become acquainted with the daily winter life of herder families, go hunting, go ice fishing, take a bath in kharzny waters (very cold, icy water in rivers), take a bath in a hot spring surrounded with snow, and play ice anklebone shooting games. Director of Tseren Tours E.Tserendolgor: As I see it, it would be challenging to develop the sector without state support and without paying attention to foreign promotions. Finally, I see that winter tourism is just becoming a highly localized event, and is heading toward its end, not being able to develop. First of all, it is vital to determine our target audience for winter tours. If we would attract more tourists to events that are mostly attended by local residents, Mongolia would open up possibilities to draw in foreign currency. Even though Mongolians are taking measures toward moving forward, there is almost no promotion directed to foreign countries. It's not that foreigners are not interested in winter tours in Mongolia, but we are not delivering promotion to make them aware. These few private companies are not able to do everything at their own expense. Chief Operating Officer of Nomadic Expeditions D.Gereltuv: Tourism in Mongolia is actively carried out during a few summer months, so the sector's role and contributions to the nation's society and economy is not strengthened. Because of that, good personnel from the tourism sector are entering the mining sector. By developing winter tourism, service organizations would see more profit, expand their activities, and jobs would increase; following these changes, Mongolia's income would increase. In order to develop winter tourism, Mongolia will need to create comfortable accommodations for tourists and increase the number of tourist attractions. The state should pay attention to this issue and provide support. For instance, China pays a lot of attention to creating new tourism products, and works toward promoting their customs and traditions through tourism. Developing winter tourism through only the private sector's involvement would require lots of time. Director of Mongolian Expeditions S.Aldarkhishig: Starting from October, tourism becomes inactive in Mongolia. The government faces many challenges, and it is a difficult period when the currency exchange strengthens and the income of many sectors shrinks. Our leadership doesn't understand that winter tourism is one solution for overcoming the difficult winter period. Tourism sector representatives have been struggling to develop winter tourism without state participation, but it is impossible for only tour operators to develop the sector. This issue needs an integrated policy and a huge amount of investment. From 2012 to 2013, the Ministry of Culture, Sport, and Tourism created 16,392 km of travel routes. This was a decision that almost led the small sector to its end. Travel routes are created through market demand and travelers' interests. It is difficult for a route set by the state to attract tourists. At first, we need to introduce all of Mongolia, and then provinces, and finally, soums. I believe that if we want to develop winter tourism we need to do this based on major cities like Ulaanbaatar, Darkhan, and Erdenet.